Track and field athletes Kate Hall and Isaiah Harris are overall winners. 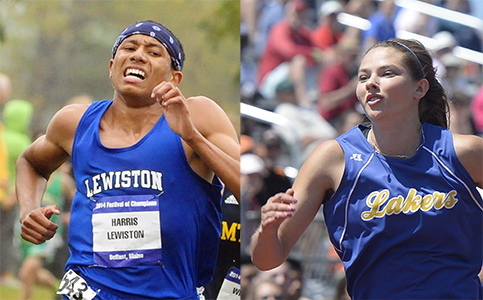 Kate Hall of Lake Region and Isaiah Harris of Lewiston set themselves apart from the competition in track and field. They excelled in track and field, setting themselves apart from the competition by finishing their high school careers in June with multiple state championships and All-America honors. For their sublime performances, Isaiah Harris of Lewiston High and Kate Hall of Lake Region High are the Portland Press Herald/Maine Sunday Telegram boys’ and girls’ Athletes of the Year. Harris, who will attend Penn State on a track scholarship, won a rare combination of the 200, 800 and 1,600 meters at the Class A outdoor state meet. He then anchored Lewiston’s 1,600-meter relay team to another win that lifted the Blue Devils to the state championship. Harris, who also starred in basketball and cross country, went on to capture the New England title in the 800 meters. At nationals, he finished third in the 800 – topping the previous Maine high school all-time best by almost two seconds. Hall won two national titles this year in the long jump during the indoor and outdoor seasons, setting a U.S. high school outdoor record with a leap of 22 feet, 5 inches. She won six events total at the Class B indoor and outdoor state meets. The Casco resident will attend Iowa State on a track scholarship. Hall also won the Athlete of the Year honor in 2014, making her just the third athlete to win twice since the awards began in 1988. Jamie Cook of Kennebunk (1993-94) and T.J. Caouette of Winthrop (1995-96) were also two-time winners. The left-hander was almost unhittable while leading the Red Riots to the Western Class A title. Henry Curran of South Portland put together a number of dominating performances this season, including 19 strikeouts in a win over Cheverus and 14 in a game against Portland. Henry Curran of South Portland didn’t start pitching until his freshman year. By the time of his senior season this spring, the left-handed Curran possessed a fastball in the mid-80s, a sharp-breaking curve, and the command to throw both for strikes. Curran gave an indication of the type of season he would have on opening day when he held Thornton Academy to one-hit through six innings while striking out 12 in a 7-1 win. Curran would go on to help lead the Red Riots to the Western Class A title and a berth in the state final, where they lost to Bangor, 5-4. Because Curran pitched in the regional final against Portland three days earlier, he wasn’t eligible to pitch in the state final. Curran pitched two other one-hitters, played solid outfield when he wasn’t on the mound and chipped in with some key extra-base hits. He’s the Maine Sunday Telegram’s baseball Player of the Year. “When I first saw him as a freshman, I saw someone with a lot of natural ability,” said South Portland Coach Mike Owens. “Henry was still growing into his body and figuring out the mechanics of being a pitcher. Two games during the regular season showed Curran’s dominance. On May 9, Curran pitched a one-hitter and struck out 19 in a 1-0 win over Cheverus. On May 21, he pitched a one-hitter while striking out 14 in a 4-0 win over Portland. He beat Portland a second time in the regional final, 2-1, as he tossed a four-hitter with eight strikeouts. Curran finished with a 7-1 record. His only loss was in a brief relief appearance against Gorham in which a defensive miscue by the Riots led to the defeat. Curran led the SMAA in strikeouts (74), ERA (0.64), fewest runs allowed (six), fewest hits allowed (17) and opponents’ batting average (.116). “My sophomore year was kind of a building year,” said Curran. “I worked on my mechanics, and my junior year I got a lot more innings. I knew what I had to work on. Curran, who played center field and left field when he wasn’t pitching, also contributed 11 stolen bases, which ranked sixth in the league. He was a top soccer goalie in the fall and ran indoor track during the winter. Curran plans to play baseball at the University of Southern Maine. Another former Red Riots pitcher, Andrew Richards, played for the Huskies and did pretty well. Curran wouldn’t mind following his lead, but perhaps without the amount of innings pitched. Connor Aube, Falmouth junior, outfield: Aube batted .412 and had a .580 on-base percentage. He scored 20 runs and had 11 RBI. Will Bryant, Greely senior, outfield: The Western Maine Conference Player of the Year and John Winkin Award finalist, Bryant batted .375 and had a 6-1 record with a 1.07 ERA and 87 strikeouts in 59 innings. Henry Curran, South Portland senior, pitcher: Curran pitched one-hitters against Thornton Academy, Cheverus and Portland, striking out at least a dozen in each game. He pitched a four-hitter against Portland in the Western Class A title game. Trevor Delaite, Bangor junior, pitcher: Delaite had an 8-0 record for the Class A state champions and struck out 81 in 51 innings. In the Eastern Maine final, the left-hander struck out 17 and pitched a three-hitter against Brewer. In two seasons, he is 13-0. Gage Feeney, Washington Academy senior, utility: A pitcher, third baseman and shortstop, Feeney batted .451 with seven doubles, a triple, a home run and 22 RBI. He had a 7-3 record and struck out 101 in 62 innings. Andrew Hillier, Bangor senior, first base: Hillier sparked Bangor to a second straight Class A title, batting .355 with 17 RBI. He was 5-0 on the mound. Zach Hodges, Marshwood senior, outfield: Hodges batted .431 with four doubles, two triples and a home run. He was errorless in center field. Eric Hoogterp, Old Town senior, shortstop: Winner of the John Winkin Award, Hoogterp batted .611 with 21 RBI and 25 runs scored. He was the Penobscot Valley Conference Player of the Year. Tanner Laberge, Windham senior, second baseman/pitcher: Laberge finished with a .391 average and five doubles. He posted a 1.83 ERA and struck out 49 batters in 341/3 innings. Ben Lambert, Thornton Academy senior, utility: The MVP of the SMAA, Lambert led the league with a .393 average, four triples and 37 total bases. He made eight starts on the mound, and his 57 innings pitched were the most in the league. John Parker, Brunswick senior, utility: The KVAC Player of the Year, Parker was a pitcher and also played first and third. He batted .510 to go with a 5-3 record and 71 strikeouts in 45 innings. Zack Quintal, Marshwood senior, third base: The Maine Gatorade Player of the Year, Quintal batted .440 with 21 runs scored, two triples and a double. As a pitcher, he was a 7-1 with a 0.85 ERA. Ryan Ruhlin, Portland senior, catcher: Ruhlin played errorless ball behind the plate and teams rarely tried to steal against him. He batted .381 and led the Bulldogs with 15 RBI. As a pitcher, he had a 7-2 record with four saves and a 1.45 ERA. Josh Stowell, Deering: In his first season, Stowell directed the Rams to a 10-6 regular-season record and a prelim playoff victory over Cheverus before a 4-3 loss to Portland in the Western Class A quarterfinals. Stowell took over a program that had won only 10 games total the previous three years. 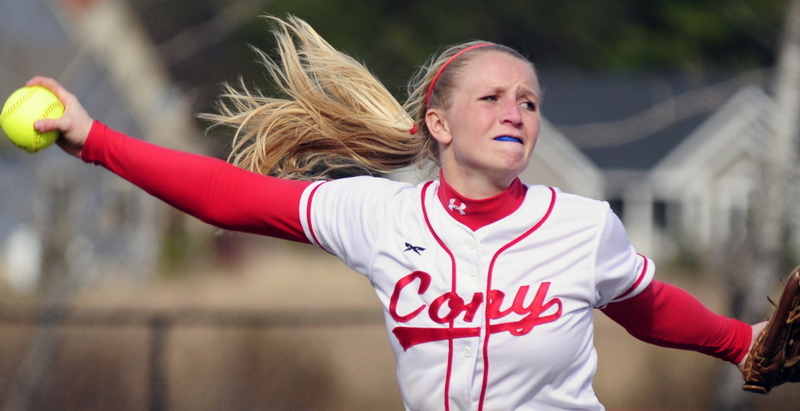 Cony’s Arika Brochu brought a fierce competitiveness as both a pitcher and a hitter. “She was probably the most competitive athlete I’ve ever coached against,” said Bangor Coach Don Stanhope. Arika Brochu was about as complete a softball player as you were going to see this year. A senior pitcher for Cony High of Augusta, she led the Rams to the Eastern Class A semifinals, where they lost 4-3 to Bangor. She was also a power hitter and flawless fielder. And as the only senior for Coach Rocky Gaslin, she became a leader. Brochu, who is heading to St. Anselm College in Manchester, New Hampshire, is the Maine Sunday Telegram’s softball Player of the Year. Her statistics were impressive – she was 12-4 with 94 strikeouts, 15 walks and a 1.37 ERA in 1072/3 innings while hitting .618 with five home runs, 32 runs and 24 RBI. But it was her competitive zeal that often set Brochu apart from others. Maybe that’s because softball is a game that Brochu said she has been playing since she was 4 years old. “And I’ve been pitching since I was 7,” she said. Brochu, who holds Cony’s career home run record with 18, also played shortstop and center field, but it was pitching that kept her going. Brochu said she will always remember winning a state championship her freshman year, when her sister, Alyssa, played second base. But her last game was pretty memorable, too. While the Rams were eliminated, Brochu had three hits, including a double and a triple, and drove in two runs while also pitching and making a diving catch. “I think that was the game of her life,” said Gaslin. Arika Brochu, Cony senior, pitcher: The KVAC Player of the Year, Brochu went 12-4 with a 1.37 ERA, 94 strikeouts and just 15 walks in 1072/3 innings. She also batted .618 with five home runs, 32 runs and 24 RBI. Emily Gilmore, Bangor junior, outfielder: The No. 2 hitter for an explosive offense, Gilmore batted .465 with 13 doubles, two triples, five home runs, 18 RBI and 30 runs. She covered a lot of ground in center field and made just two errors. Tess Haller, Cape Elizabeth junior, infielder: Haller hit .465 with 13 doubles, two triples and five home runs. She drove in 18 runs and scored 30. She played seven games at second base, then moved to third for the rest of the season. Jen Jones, Sanford junior, pitcher: Maine’s Gatorade Player of the Year, Jones led Sanford to a No. 3 seed in Western Class A. She went 14-3 with 225 strikeouts in 121 innings and a 1.56 ERA. She batted .448 with 23 RBI and 11 runs scored. Aly LeBlanc, Madison junior, catcher: LeBlanc helped the Bulldogs reach the Western Class C final, hitting .450 with six doubles, three triples and two home runs. She drove in 26 runs, scored 24, and did not allow a stolen base. Maggie Murphy, Scarborough junior, third baseman: Murphy batted .378 with five doubles, two home runs, 14 RBI and 22 runs. She committed just three errors while helping Scarborough advance to the Class A championship game. Kirsten Pelletier, Messalonskee junior, pitcher: Pitched all but one game, including a 1-0 victory in the Class A state final (allowing two hits and striking out 12). Pelletier was 16-3 with 182 strikeouts in 136 innings while walking 23. Kristy Prelgovisk, Messalonskee senior, outfielder: Prelgovisk’s homer provided the offense in a 1-0 win over Scarborough in the Class A championship game. She batted .511 with 10 home runs, 29 RBI and 16 runs and did not make an error. Stephanie Rundlett, York junior, pitcher: Rundlett led the Wildcats to the No. 2 seed in Western Class B. She went 15-2 with a 0.96 ERA and 246 strikeouts in 117 innings. She also batted .561 with three homers, 27 RBI and 17 runs scored. Kaleigh Scoville, Scarborough junior, first baseman: Scoville made the move from center field and was nearly flawless at first base, committing just one error. She hit .514 with eight extra-base hits, 25 RBI and 30 runs scored. Kristal Smith, Gardiner senior, pitcher: A finalist for Miss Maine Softball, Smith batted .500 with six home runs, 32 RBI and 21 runs scored. She was 17-1 with 143 strikeouts in 111 innings and a 0.36 ERA. Ashley Tinsman, Cape Elizabeth senior, shortstop: A three-time all-state selection, Tinsman will attend UMaine. She hit .380 with 17 runs and 13 RBI. Bailey Tremblay, Thornton Academy senior, pitcher: Winner of the Miss Maine Softball Award, Tremblay was 14-2 in the regular season with a 2.01 ERA and 130 strikeouts. She hit .547 with four home runs, 24 RBI and 11 runs. Amy Ashley, Yarmouth: In just her third year, Ashley led the Clippers to the Class B state championship. She emphasized game situations in practice, which ultimately prepared her players for any situation. Field hockey may be her priority, but she's not bad in her 'fun' sport, either. In her final high school game, Lindsey Poirier, right, finished in style with a Class A girls’ lacrosse state championship, which she celebrated with Gabrielle Bazemore and the rest of her Marshwood teammates. Lindsey Poirier calls lacrosse her fun season. She had plenty of fun this spring. A senior attack at Marshwood High, Poirier finished this season with 73 goals and 26 assists and led the Hawks to the school’s first Class A lacrosse state title. In the Western A final, she had seven goals and three assists in a rout of Scarborough. Poirier added seven more goals in the state championship game against Messalonskee. “She was definitely a dominant player and I really think she played her best in the games that mattered the most,” said Thornton Academy Coach Craig Agreste. Add it all up, and Poirier earned the honor of Maine Sunday Telegram girls’ lacrosse Player of the Year. Field hockey has long been Poirier’s first athletic priority. Her mother, Lisa Truesdale, is Marshwood’s field hockey coach. Poirier accepted a field hockey scholarship to Southern New Hampshire University. She might play lacrosse in college and has talked with SNHU lacrosse coach Kate Mullen, but wants to spend a term combining sports and studies before making a decision. Lacrosse highlighted Poirier’s natural athletic combination of strength and speed. Playing for a coach who wasn’t her mother was also “refreshing,” Poirier said. Marvin said one of the best things he did for both Poirier and his team was to move Poirier to attack this season. In the past, she and fellow all-state player Korinne Bohunsky formed a dynamic duo in the midfield. The move paid off in championship style. “Now all the girls coming up can just expand on that and I think that’s a beautiful thing,” Poirier said. Sydney Bell, Falmouth sophomore, midfielder: An athletic player who could take draws and cause turnovers on defense, she improved as a distributor and led Falmouth in goals (48) and tied in assists (16) despite missing two games to injury. Korrine Bohunsky, Marshwood senior, midfielder: Exceptional on draws, Bohunsky impacted the game at both ends and compiled 40 goals and 18 assists. She will play at the University of New England. Jenny Bush, Kennebunk junior, midfielder: A repeat all-state pick, Bush was the lone All-American selected by Maine coaches this season. She led Kennebunk with 55 goals and added 17 assists. Angie DiPhilippo, Falmouth senior, defense: Called the “heart of the team,” by Coach Kait Johnson, DiPhilippo was a strong defender with confident stick skills. She will play at Hobart College. Shannon Fallon, Yarmouth senior, attacker: Led the Clippers in goals (56) and assists (28) as Yarmouth improved throughout the season en route to its second straight Class B state title. Livy Golini, York senior, goalie: Had a save percentage of over 60 percent. Very active and verbal, Golini routinely intercepted passes and secured ground balls in her third year as a starter. Helen Gray-Bauer, Waynflete senior, defense: Leader of one of the state’s top defenses, she impressed with tenacity and on-ball defensive pressure. Gray-Bauer will be attending Skidmore as a music major. Lindsey Poirier, Marshwood senior, attacker: Poirier flourished when she was moved to attack from the midfield, collecting 73 goals and 26 assists. 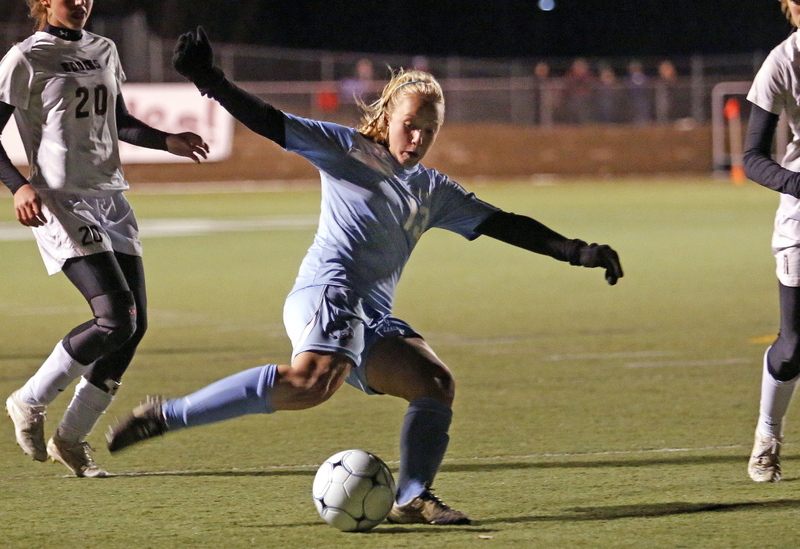 She scored seven goals in both the regional and state finals. Kaitlin Prince, Scarborough senior, midfielder: Able to win draws with accuracy, the four-year varsity player led the Red Storm in scoring with 52 goals and 26 assists. She will play at Division II Rollins (Fla.) College. Olivia Sandford, Kennebunk junior, midfielder: Sandford was vital all over the field. She was on the draw circle, ran the defense from the top of the zone and contributed 31 goals and 10 assists. Kyra Schwartzman, Kennebunk junior, attacker: With good speed and a precise shot, Schwartzman tied for the team scoring lead (49 goals, 23 assists) and was key to the Rams’ ability to possess the ball for long stretches. Emma Torres, Yarmouth senior, midfielder: An all-around player for the two-time Class B champs, Torres had 38 goals and 10 assists. In the Class B state final, she scored four goals, won the draw-control battle and led the team in ground balls. 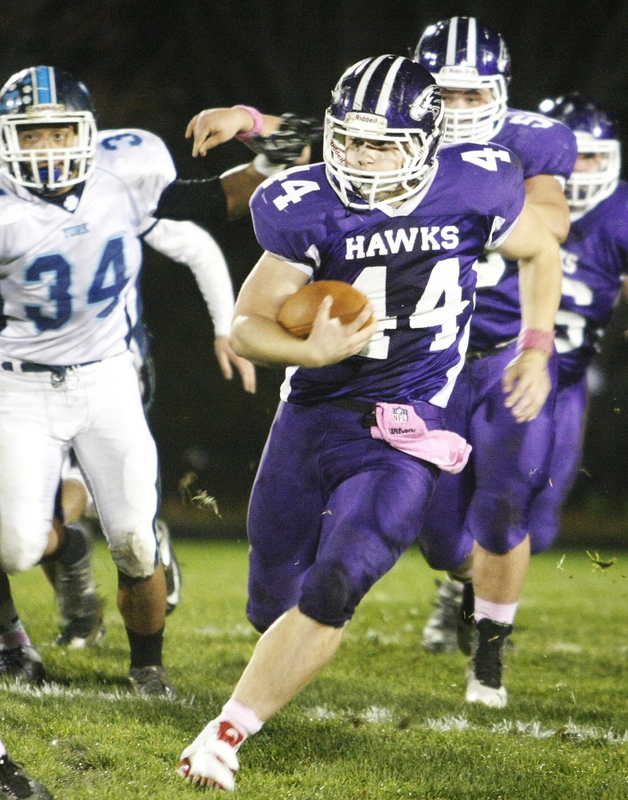 Bernie Marvin, Marshwood: The Hawks have been a top team in Class A for several seasons. This year, Marvin mixed veterans with young players, made position switches that strengthened the squad, and got his team to peak at the right time as it won the Class A championship. The Red Riots' goalie forced opponents to change their games and keyed another deep playoff run. T-Moe Hellier was an intimidating presence for South Portland on its way to back-to-back Western Class A boys’ lacrosse championships and the 2014 state title. “He plays with a swagger that makes a difference. I’d say he’s the difference of four or five goals a game,” said Westbrook Coach Josh Plowman. 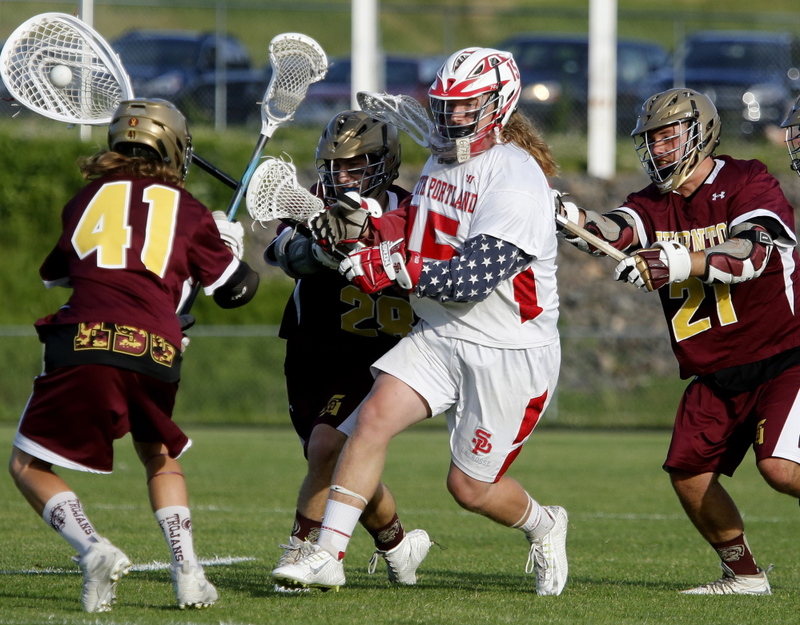 Edward Marley Hellier of South Portland is the best boys’ lacrosse goaltender in the state. That’s a strong consensus opinion even if opposing coaches and players don’t immediately recognize the name. To the Maine lacrosse community, he is simply T-Moe, the game-changing goalie who led South Portland to two straight Class A championship games, including a victory in 2014. Hellier is the Maine Sunday Telegram/boys’ lacrosse Player of the Year because of his skill and the respect he’s earned from opposing coaches. “He forces you to have to change what you’re trying to do,” said Cheverus Coach Bill Bodwell. “He plays with a swagger that makes a difference. I’d say he’s the difference of four or five goals a game,” Westbrook’s Josh Plowman said. “In my opinion, South Portland has three or four more losses without T-Moe,” Thornton Academy Coach Ryan Hersey said. Hellier is grateful for the recognition. South Portland Coach Tom Fiorini said the praise is justified. Hellier made 91 saves – the lowest total in his four seasons as a starter. South Portland allowed just 4.4 goals per game before its 13-9 loss to unbeaten Brunswick in the Class A title game. So, what is the origin of T-Moe? His father Edward, a beloved youth coach in South Portland who died June 17, 2013, was called Ted. Ted and Susan Hellier planned to call their son Teddy Marley, but older sister Eliza mispronounced it as Teddy Moe. Soon, it was simply T-Moe. This fall, he’ll begin making his name at Division III Goucher College in Towson, Maryland, a suburb of lacrosse hotbed Baltimore. “They’re going to get this kid and I’ll be shocked if he’s not the starting goalie by the time his freshman season is over,” Fiorini said. Jack Drinan, Cape Elizabeth senior, defenseman: Versatile player who shifted from midfield to strengthen Capers’ defense. Drinan led the team in ground balls and excelled at causing turnovers and clearing balls to the offense. Jack Fiorini, South Portland junior, midfielder: The only non-senior in Maine to be named All-America this year, the tall, physical Fiorini scored 42 goals and added 31 assists and 56 ground balls. Cam Glover, Brunswick senior, midfielder: Led the Dragons to their first state title since 2007 with five goals in the Class A final against South Portland. He had 51 goals and 22 assists, is a two-time All-American and two-time KVAC Player of the Year. T-Moe Hellier, South Portland senior, goalie: A repeat All-Telegram pick and two-time All-American, Hellier made 91 saves and had a 4.4 goals-against average entering the state final, and was known for his ability to change opponents’ shots and attack plans. Bryce Kuhn, Falmouth senior, attacker: An All-America selection, Kuhn had 57 goals and 13 assists to lead Falmouth to the Western Class B final. A top student, Kuhn will attend Colgate University. Tommy Lawson, Cheverus senior, midfielder: The SMAA Player of the Year as a junior and a two-time All-American, Lawson produced 46 goals and 21 assists. A nose guard in football, Lawson will play lacrosse at Stevens (N.J.) Institute. Henry Oliva, Yarmouth senior, defenseman: Often overshadowed by his twin brother, Oliva did his best work against the top attackmen in the state. A first-team All-WMC player, Oliva led Yarmouth with 46 ground balls. Joe Oliva, Yarmouth senior, attacker: A proficient scorer, Oliva added 29 assists to his 46-goal season and was also second on the team with 34 ground balls, a rarity at attack. He and his brother will play at Colby College. Griffin Thoreck, Cape Elizabeth senior, attacker: A two-time All-American, Thoreck shifted from midfield to attacker this season. 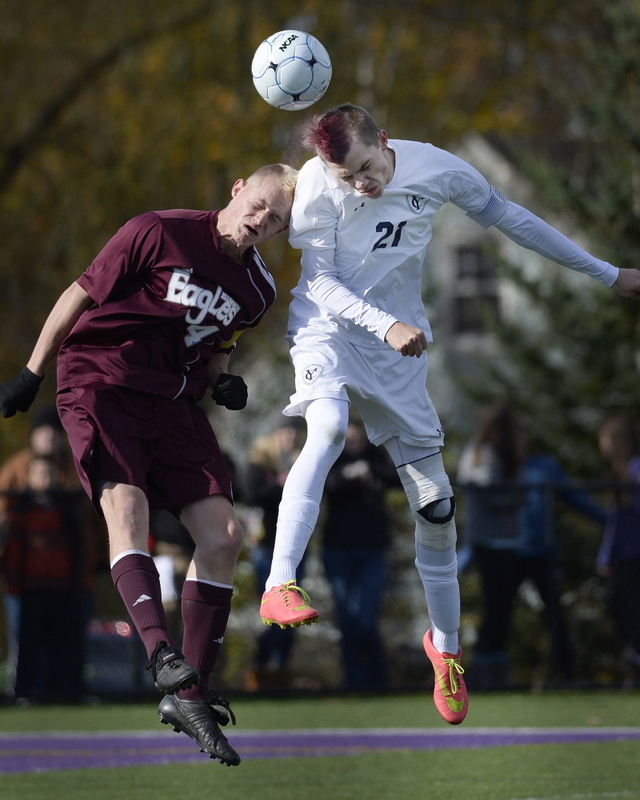 He led Cape to its third straight Class B title with 47 goals and 27 assists. He’ll play at Division III Lynchburg (Va.). Jake Truman, Gardiner senior, defenseman: Truman and teammate Josh Caldwell led the Tigers to the Eastern Class B semifinals and were named All-Americans. After several near misses, Salas finally won the state singles title and was undefeated this season. Isaac Salas of Waynflete came close in the past – twice reaching the quarterfinals and once the semifinals of the state singles’ tournament – but left no doubt this season as he won the title. He also helped the Flyers win their eighth straight Class C team title. 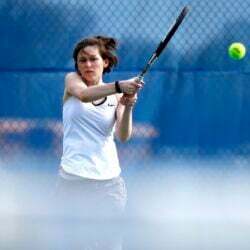 As tennis coach at the Waynflete School, Jeff Madore has had the pleasure of coaching four players who won a state singles championship: Christine Ordway, Brandon Thompson, Patrick Ordway and Isaac Salas. Of that talented quartet, Salas, a senior who won the boys’ title this spring, might be the hardest worker. Salas not only won the singles tournament as the second seed, he also led the Flyers to an eighth straight Class C state crown in the team tournament. He is our choice as Maine Sunday Telegram Player of the Year for boys’ tennis. A quarterfinalist his first two years, Salas reached the semis last spring before losing to eventual champion Brendan McCarthy of Falmouth. McCarthy now plays at Bentley College. This spring, Salas won his semifinal match 6-3, 6-3 over third-seeded Serbian exchange student Luka Stevic of Lee Academy before edging top-seeded sophomore Nick Mathieu of Mt. Ararat, 7-6 (5), 6-3 inside the Racket & Fitness Center in Portland. Both matches were moved inside because of rain. In four years of team competition, Salas lost only three matches: two as a freshman and one as a sophomore. 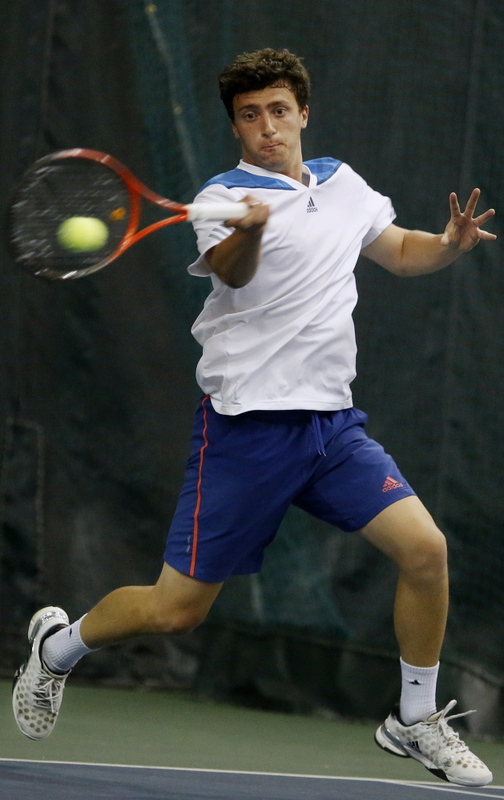 The lone loss in 2013 was a three-set match against Michael Mills of Cape Elizabeth. They met twice this spring and Salas did not drop a game. “That tells you how hard he worked” to improve, Madore said. Salas grew up in Camden playing hockey and tennis and, except for the school year, when his family rents an apartment in Portland so that he can attend Waynflete, he continues to live there. He has an older sister and brother, both of whom played high school tennis, but not nearly with the same intensity. He arrived early at Lewiston High on the day of the championship team matches in order to see his buddies at Camden Hills give Cape Elizabeth a scare before the Capers won their third straight Class B crown. Salas plans to continue his career at Franklin & Marshall College in Lancaster, Pennsylvania. Teodor Antelj, Fryeburg Academy junior: Serbian exchange student who reached semifinals in state singles tournament before falling 7-6 (5), 6-4 to runner-up Nick Mathieu of Mt. Ararat. Went 11-1 in team play and plans to return for his senior year. Luke Horton, Mt. Desert Island senior: Reached quarterfinals of state singles tournament as eighth seed before falling to Mt. Ararat’s Nick Mathieu, 6-3, 6-1. Undefeated in two years of team competition at No. 1 singles. Two-time Penobscot Valley Conference player of the year. Nick Mathieu, Mt. Ararat sophomore: Two-time runner-up in state singles tournament who remains unbeaten in team competition for the Eagles, who have won back-to-back Eastern Class A titles. Aidan McGrory, Falmouth senior: Fifth seed in state singles tournament who reached quarterfinals before falling 6-2, 6-4 to Fryeburg’s Teodor Antelj. Helped Falmouth to its second straight Class A team title. Victor Menezes, Thornton Academy senior: Seventh seed in state singles tournament who reached quarterfinals before falling to eventual champion Isaac Salas of Waynflete 6-2, 6-0. Unbeaten in team competition. Tristan Rother, Fryeburg Academy junior: German exchange student who upset No. 6 Michael Mills of Cape Elizabeth in state singles tournament before falling in the quarterfinals. Went 12-0 in team competition to help Raiders reach regional finals. Isaac Salas, Waynflete senior: After reaching semifinals a year ago as third seed, won state singles tournament as second seed by defeating Mt. Ararat’s Nick Mathieu 7-6 (5), 6-3 in the finals. Also led Waynflete to its eighth straight Class C state title. Luka Stevic, Lee Academy senior: Serbian exchange student who reached semifinals of state singles tournament before falling 6-3, 6-3 to eventual champion Isaac Salas of Waynflete. Lost only three games in 14 matches in team competition. Brian Higgins, Ellsworth: Now in his fourth decade as head coach of both the girls’ and boys’ programs at Ellsworth, Higgins guided the boys through an undefeated regular season and appearance in the Eastern Class B final. The boys are 313-110 since Higgins started the program in 1981. The girls, who began play in 1983, are 343-87. 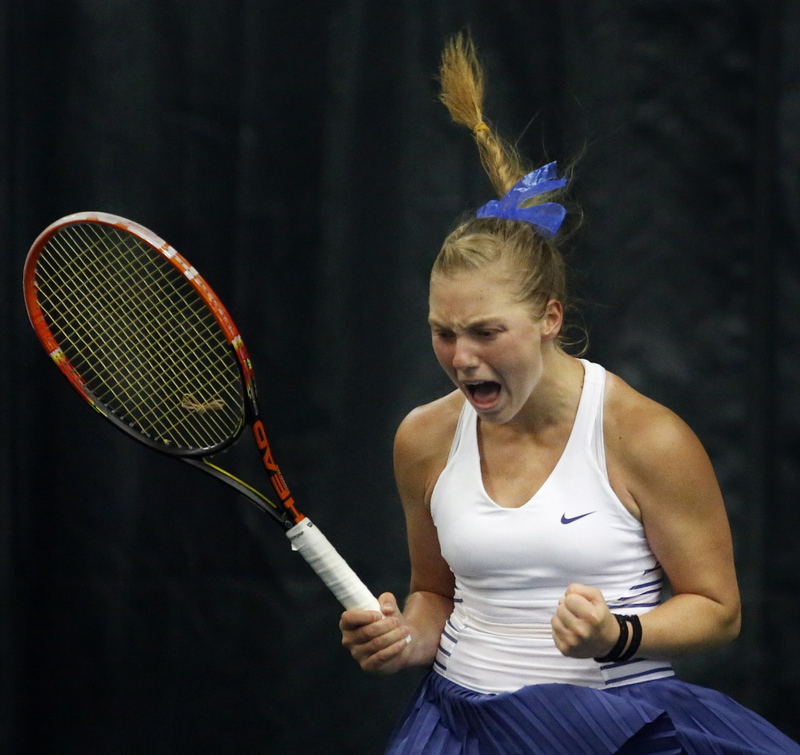 Leavitt ended her high school career with three state singles title, four team championships and a 69-2 match record. Olivia Leavitt of Falmouth celebrates after winning her third straight singles state championship in June. Then two weeks later, she helped Falmouth win its eighth straight team state championship. Last month, after graduation from Falmouth High School, Olivia Leavitt visited Acadia National Park, took a ferry to Little Cranberry Island and hiked Cadillac Mountain, the highest peak on Mount Desert Island. It was her first trip to Bar Harbor, less than a three-hour drive from her home. Forgive her. She’s been busy. Leavitt wrapped up her four-year high school tennis career with a third straight singles title to go along with Falmouth’s eighth straight team state championship. She didn’t drop a game as Falmouth swept Lewiston for the Class A crown, not quite two weeks after she held off a spirited challenge from St. Dominic sophomore Bethany Hammond in the singles final. For the third year in a row, Leavitt is our choice as Maine Sunday Telegram Player of the Year for girls’ tennis. She entered the singles final having dropped only four games in five matches, but the left-handed Hammond forced Leavitt to dig deep. It was 4-all in the first set, and Hammond led 6-5 in the second after surviving five match points before Leavitt finally prevailed 6-4, 7-6 (1). Leavitt required three sets to win the 2014 singles final against Maisie Silverman of Brunswick. She also beat Silverman in straight sets in the 2013 final after losing a three-setter in the 2012 semis, also to Silverman, the eventual champion who now plays at Bates College. Leavitt plans to continue her career at Brandeis University. In four years at Falmouth, she was a combined 69-2. Her only other loss came in the 2013 Class B team state finals against Waterville because of injury default after Falmouth had clinched the match. This spring, only one player other than Hammond was able to win more than two games in any set against Leavitt. Greely freshman Izzy Evans lost 6-2, 6-3 in mid-May. Leavitt plans to play in the Betty Blakeman Memorial in Yarmouth in July before a trip to Norway to visit relatives. She has yet to decide if she’ll bring her racket. Margot Andreasen, Portland senior: Quarterfinalist in state singles tournament as 11th seed, knocking off No. 6 Sarah Gray of Morse before falling to No. 3 Rosemary Campanella of Wells. In team play, she never lost a set until the Western Class A semifinals against Falmouth. Julia Brogan, Falmouth junior: Unbeaten in team competition for the two-time Class A state champs. Fourth seed in the singles tournament who reached the semifinals before her only loss of the season, to eventual champ (and teammate) Olivia Leavitt. Rosemary Campanella, Wells freshman: Because her school doesn’t offer tennis, Campanella played only in the state singles tournament and reached the semifinals as the No. 3 seed before falling 6-1, 6-2 to runner-up Bethany Hammond. Izzy Evans, Greely freshman: Fifth seed in singles tournament who reached the quarterfinals before falling 6-4, 6-3 to Falmouth’s Julia Brogan. In team play, she led Rangers to their second straight Class B state title, providing the clinching point in both the regional and state finals. Bethany Hammond, St. Dominic sophomore: As second seed in the state singles tournament, she advanced to the finals before falling 6-4, 7-6 (1) to three-time champ Olivia Leavitt of Falmouth. A singles semifinalist a year ago, Hammond led the Saints to Western Class C semifinals. Olivia Leavitt, Falmouth senior: Three-time singles state champion who overcame a challenge from Bethany Hammond in the finals 6-4, 7-6 (1). Led Falmouth to its eighth straight state title, second in Class A. Will play tennis at Brandeis. Caroline Ray, Falmouth junior: Tenth seed in singles tournament who reached quarterfinals before falling to Bethany Hammond. 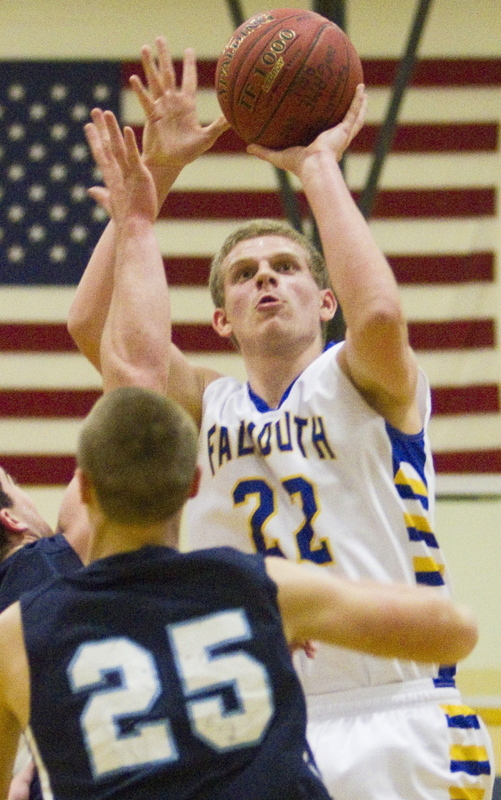 Unbeaten in team competition, helping Falmouth extend its winning streak to 125 matches. Lena Rich, North Yarmouth Academy junior: Eighth seed in state singles tournament who reached quarterfinals before falling 6-1, 6-1 to Olivia Leavitt. Led NYA to Class C state championship, ending Waynflete’s four-year reign in regional finals. Ben Caswell, Greely: In his third year as head coach, Caswell led the Rangers to a second straight Class B state title – the first two in school history. The Rangers are 29-3 over the past two seasons and have all three singles players scheduled to return. The 18-year-old from Casco not only set Maine records, she set new standards on a national level as one of the best athletes ever to come out of Maine. Long jumping isn’t the only event in which Hall excels. She was also a record-setting sprinter. Hall had just bounded down the long jump runway for the last time in her high school career and leapt into the record books with a jump of 22 feet, 5 inches to win her second national title and take ownership of a 39-year-old national high school record. Not even Kersee as a high schooler in 1981 could break the record that stood since 1976, and Kersee went on to set the world record in the long jump. The exchange between the three-time Olympic gold medalist and Hall speaks volumes about what the 18-year-old from Casco has achieved. As of last week, Hall’s historic jump ranked her 15th in the world this year and sixth in the U.S.
Hall broke numerous records (U.S. junior record, Eastern States, New England, Maine all-time) when she surpassed the mark of 22-3 set by Kathy McMillan of Raeford, North Carolina, in 1976. But Steve Vaitones at the USA Track and Field office in Boston said breaking the national high school record sets Hall apart because it was the oldest national high school record in annals that have been kept since 1903. “U.S. high school record covers almost all the grounds necessary to impress the average fan, and breaking a 39-year-old mark is the exclamation point,” Vaitones noted. McMillan first captured the national record with a jump of 21-7 in 1975, and then broke her record four more times, surpassing 22 feet twice. Hall left it to the very last jump of her high school career to surpass 21 feet for the first time. “She never lets us down,” said her coach, South Portland trainer Chris Pribish. There was no question Hall would be the Maine Sunday Telegram performer of the year for girls’ outdoor track. She had already set two records at the New England championships. The question was how would Hall end her high school career. This time, Hall amazed even herself with her come-from-behind win and national record. Kellie Bolduc, Waterville senior, hurdler/jumper: Captured the triple jump (36-1) and finished third in the 100 hurdles (16.16) and fifth in the high jump (4-10) at the Class B meet to help her team to its ninth straight state title. Alyssa Coyne, Greely junior, thrower: Took sixth at New Englands in the discus (118-8) after winning Class B state titles in the shot put (37-6 3/4) and discus (127-10). Tori Daigle, Thornton Academy senior, jumper: Took sixth place at the New England championships in the long jump (17-1 1/2). Also won a Class A title in the triple jump (36-13/4) and placed second in the long jump (17-1 1/2). Kate Hall, Lake Region senior, sprinter/jumper: Set a U.S. high school record of 22-5 in the long jump at nationals and finished third in the 100 (11.37). Set two records at New Englands and won three events at the Class B state meet, including the 200. Alex Hart, Thornton Academy freshman, sprinter: Finished third at New Englands in the 400 (57.90). Also set a Class A record in the 400 (56.87) at the state championships, won the 200 (25.95) and finished second in the 100 (13.00). Victoria Lux, Thornton Academy senior, jumper: Finished fourth at New Englands in the shot put (40-6 3/4). At the Class A state meet, she won the shot put (38-3) and took second in the discus (113-1). Sarah Shoulta, Waterville senior, hurdles: Captured the 100 hurdles (15.77), and 300 hurdles (47.65) at the Class B state championships, and finished second in the pole vault (9-6) to help her team win its ninth straight state title. Maddie Stella, Noble senior, throws: Won the discus (113-6) at the Class A state meet and finished second in the shot put (37-1 3/4). Lauren Stoops, Orono junior, sprints: Won the 100 (12.50) and 200 (26.24) as well as the 300 hurdles (46.95) at the Class C state meet. Tiara Tardy, Mattanawcook Academy sophomore, distance: Took fifth in the 800 (2:14.33) at New Englands. Also won Class C titles in the 800 (in a record time of 2:16.34) and 3,200 (11.39.10). Rob Stanton, Waterville: Had big shoes to fill following the departure of Coach Ian Wilson, who led the Panthers to eighth straight Class B state championships. Stanton guided Waterville to a ninth consecutive title in convincing fashion. Versatile, competitive and very fast ... and a New England champion. Isaiah Harris showed his versatility at the Class A state meet, winning the 200, 800 and 1,600 meters and running the anchor leg for the winning 1,600 relay team. A week later, he won a New England title in the 800. During regular-season meets, Isaiah Harris of Lewiston pretty much picked his events, said Coach Paul Soracco. But once the Class A championship meet arrived, it was up to Soracco to decide where to use his talented runner. “Track is an individual sport, but there’s the team aspect of trying to win a state championship,” said Soracco. “My job is to give us the best chance to do that. Harris went from third to first shortly after the handoff in the 1,600-meter relay and stayed there to give the Blue Devils the victory and the state title. That completed a memorable day in which Harris, a senior, won the 200, 800 and 1,600. Those three individual races are an unusual combination for a runner, but one that Soracco felt Harris could handle. “If you put a challenge in front of Isaiah, he’s all over it,” said Soracco. “If he has someone to catch, he’s going to catch him. That’s a vast array of races – from the 200 to the mile. Not only to be able to do it, but be the best that day at both spectrums, that’s pretty amazing. Harris gave a sampling of that potential when he took third in the 800 at the New Balance high school national championships in Greensboro, North Carolina. His time of 1:49.63 was a Maine high school all-time best by almost two full seconds. Harris is the Maine Sunday Telegram’s boys’ outdoor track athlete of the year. Harris will attend Penn State University on a track scholarship. He also looked at Georgetown. Harris said he was nervous before nationals. “It was my last high school meet. Once I got onto the track, everything was fine,” he said. Harris ran in the first of four heats. Soracco believes that if Harris had been in the last heat – which included the top-seeded runners – he could have won the event. Give Harris a challenge or someone to chase down, and he usually succeeds. Jack Bouchard, York junior, javelin: Bouchard set a Class B record in the javelin with a throw of 200 feet, 6 inches to help the Wildcats win the state title, then won the New England championship (196-1). Nicolas Boutin, Old Town senior, sprints: Boutin won the 100 and 200 at the Class B meet and ran a leg on the winning 400 relay team. His time in the 100 (11.22 seconds) was the best in all classes. Jake Dixon, Cheverus senior, sprints: Dixon set a Class A record in the 400 (48.45) and finished second in the 200 (22.41) in a close race. He was third in the 400 and eighth in the 200 at New Englands. Justin Gagnon, Biddeford senior, hurdles/jumps: Gagnon won the 110 hurdles, finished third in the triple jump and was seventh in the long jump in Class A. Drew Gamage, Oak Hill senior, jumps: Gamage set a Class C record in the triple jump (45-91/2). He placed second in the high jump and fifth in the long jump. At the New England meet, he was third in the triple jump (46-1 1/2). Dan Guiliani, South Portland junior, thrower: Guiliani won Class A and New England titles in the shot put and shattered the all-time state best with a throw of 66-5 during the regular season. He also finished second at the state meet and sixth in New England in the discus. 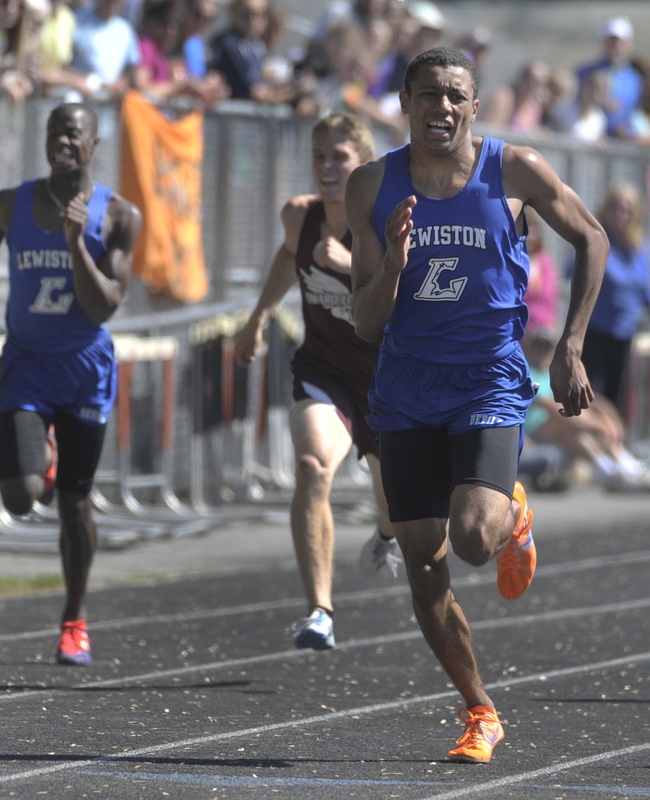 Isaiah Harris, Lewiston senior, sprints/middle distances: Harris won the 200, 800 and 1,600, and ran the anchor league on the 1,600 relay as the Blue Devils won the Class A title. Harris won the 800 at New Englands and was third at nationals, lowering the all-time state best (1:49.63) by nearly two seconds. Drew Nealey, Belfast junior, pole vault/hurdles: Won the pole vault (14-0) at the Class B meet and was also third in the triple jump and 110 hurdles and fifth in the 300 hurdles. Nick White, Cheverus senior, throws: Won the discus (161-11) at the Class A state meet and finished second in New England (162-4). Also placed second in the Class A shot put. Victor Yang, Fryeburg Academy junior, jumps: Yang won the high jump and triple jump at the Class B state meet. His 6-foot-6 effort in the high jump was the best in any class. Paul Soracco, Lewiston: In his first season, Soracco guided the Blue Devils to their first Class A state title since 2006. He coached the Lewiston Middle School team before this season, and before that was an assistant football coach at Reading (Mass.) High. The offensive leader won the Vinall Trophy after scoring 42 points in a semifinal game. Jack Simonds of Falmouth is the Maine Sunday Telegram’s Player of Year in boys’ basketball. Simonds had to step up his offense for the Yachtsmen this year, averaging 23.4 points per game. When Falmouth guard Thomas Coyne went down with an injury before the season, Jack Simonds knew he would have to assume more of the offensive load for the Yachtsmen. Simonds averaged 16 points per game as a junior, but he’d be asked to do more for a team that hoped to contend in Western Class A. “I knew I had to become more aggressive,” said Simonds. But he wasn’t going to deviate from what he likes most about basketball – the team. “The team always comes first,” said Simonds, named the Maine Sunday Telegram’s Player of the Year. In his three previous seasons, Simonds was teamed with several other scoring threats. As the main option this winter, the 6-foot-6 forward increased his scoring average to 23.4 points. He also averaged 10.7 rebounds and 2.9 assists. And Simonds was even better in the postseason. He tied the Western Class A tournament record with 42 points against South Portland in the semifinals, and won the Vinall Trophy as the tournament’s top player/sportsman, even though Falmouth lost to Portland in the regional final. Not surprisingly, he credits his teammates. “They got the ball to me in good scoring positions,” he said of his outburst against South Portland. Simonds played in three regional finals and one state final in his varsity career. Falmouth won the Class B state title in his sophomore year, then moved up to Class A. This season, the Yachtsmen finished 17-4 after their 57-47 loss to Portland in the Western final. For Simonds, a 13-game winning streak was a season highlight, but his No. 1 highlight was the senior class going 36-0 at home over four seasons. Simonds, who will attend Bowdoin College, finished his career with 1,101 points, 612 rebounds and 104 assists. He won the Bob Butler Award as the outstanding player/sportsman in the Western Maine Conference and was a finalist for Mr. Basketball. His dad, Mike, won the Butler Award in 1992 at Scarborough High. Simonds showed he liked the spotlight when he came up big in the tournament as a freshman. Falmouth lost to Yarmouth in the Western Class B final, but won the state title the next year, with Simonds having another big tournament. Falmouth lost to Bonny Eagle in the Western A semifinals last year. The 6-foot-3 center averaged 20 points per game and will play at New Hamsphire next season. Ashley Storey led Greely to the Class B state championship this season. The Maine Sunday Telegram Player of the Year, Storey averaged 20 points, 12 rebounds, and four assists per game. Ashley Storey trusted her Greely High teammates from the first day of preseason practice in November. She knew the Rangers had the potential to go far, perhaps even win the Class B state championship. “And we did,” she said of Greely’s 56-39 win over Presque Isle. Storey, a 6-foot-3 senior center, was the focal point. In being selected as the Maine Sunday Telegram girls’ basketball Player of the Year, she averaged 20 points, 12 rebounds, 4.0 assists, 3.5 steals and 3.5 blocked shots. “You had to scheme your game around her – ‘How do we stop Storey?’ That often involved putting two kids on her,” said Gray-New Gloucester Coach Mike Andreasen. “But she could beat that with either a dribble or a pass. And the other players were great shooters because of Ashley. If she was not on the court, you could defend them one-on-one. With her on the court, you couldn’t. She showed that in many ways, said Greely Coach Joel Rogers. Maybe she didn’t talk a lot, but her actions told her teammates what they needed to know. Rogers spoke of a game against Yarmouth in which he had to pull his starters – including Storey – after 90 seconds of lackluster play. Storey knew the spotlight would be on her more this year. She would be expected to score more, rebound more. She knew she had to do more. Storey will play at the University of New Hampshire. Rogers is certain she will contribute immediately. But Storey knows there’s a lot of work to do. “You can always get better at every aspect of the game,” she said. Those who watched her the last four years saw the improvement in ballhandling and shooting, where she has extended her range to beyond the 3-point line. Rich Clark, the veteran coach at York, said her mental improvement was even more impressive. Ben Bragg earned his spot as the boys' hockey athlete of the year. From the time he strapped on the pads as a 10-year-old, Scarborough goalie Ben Bragg enjoyed knowing how much he could affect the game. And this season he affected it the most, leading the Red Storm to their first Class A state championship. Believe it or not, there was a time Ben Bragg had difficulty concentrating on his task. Bragg often forgot to open the door to let his teammates get off the ice and back onto the bench. That was Bragg’s job as Scarborough High’s third-string goalie his freshman and sophomore seasons. Once Bragg got on the ice, however, as a starter in his junior and senior years, his focused peaked. He not only watched the game but played a major role in it. 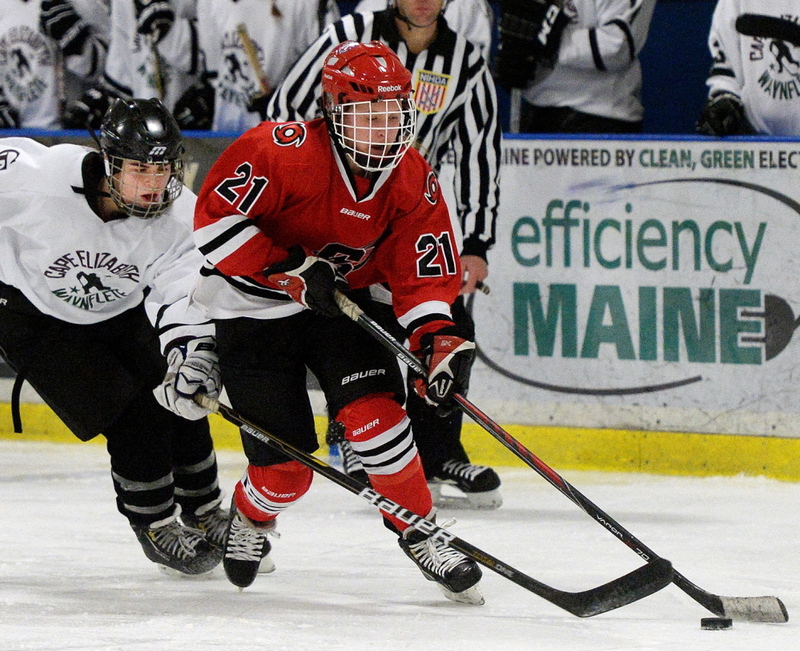 Bragg mastered the position this season and was named the Maine Sunday Telegram’s Athlete of the Year in boys’ hockey after leading the Red Storm to their first Class A state championship. He posted a 1.33 goals-against average during the year, helping a young Scarborough team become contenders. In the playoffs Bragg shined, including a 32-save performance in the Red Storm’s 2-1, double-overtime win over St. Dominic in the championship game. Five of those saves came in the first 1:20 as the Saints peppered Bragg with quality chances. Then came a sensational save he made sliding over to snuff a two-on-one chance. “Obviously they got some pretty good goaltending,” said St. Dom’s Coach Steve Ouellette. Bragg help Scarborough soar in what looked like a rebuilding season. But with Bragg, the Red Storm remained competitive. Championship thoughts began drifting into Bragg’s head when he held Falmouth to one goal in a 3-1 regular-season victory Jan. 10. The Yachtsmen came in averaging seven goals a game. “That gave us the confidence we needed,” Bragg said. It’s just what Bragg likes about being a goalie – the team depending on him. It’s why he first strapped on the pads when he was 10. Bragg hopes to keep playing and plans to try out for a couple of junior teams next month. Sami Shoebottom emerges as a leader for the Red Storm, and has two years left. Scarborough’s Sami Shoebottom elevated her offensive game this season to keep the Red Storm a contender. She finished with 46 goals and 15 assists. When the girls’ high school hockey season began, sophomore Sami Shoebottom suddenly found herself in the spotlight. Having played a big part in Scarborough High’s 2014 state championship run, Shoebottom was expected to be part of a contender again, along with two fellow All-State forwards, Lizzie Gross and Alyssa Hulst. But both of them transferred to Berwick Academy. But it was Shoebottom who elevated her offensive game to keep the Red Storm a contender. Her efforts earned her honors as the Maine Sunday Telegram Player of the Year in girls’ hockey. 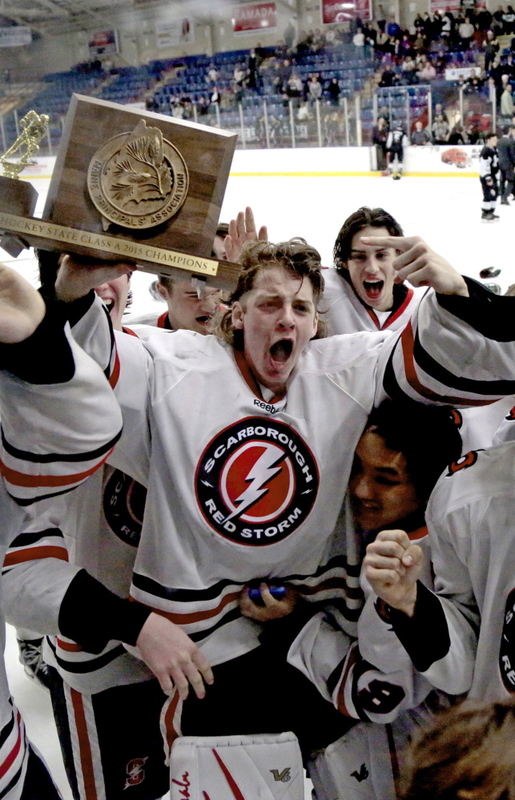 Shoebottom, daughter of former Maine Mariners and Boston Bruins defenseman Bruce Shoebottom, totaled 61 points – 46 goals and 15 assists – leading the Red Storm back to the West regional championship game. There, Falmouth beat Scarborough 4-2, with both of the Red Storm’s goals coming from Shoebottom. She went from being part of a championship team to one of the leaders on a team trying to repeat. And Shoebottom loved this season. “Last year was fun, but we felt the pressure having to succeed,” Shoebottom said of the undefeated 2013-14 team. “This year, going into it, we knew we weren’t going to be considered the best – but we were going to try. And, maybe, Shoebottom settled more comfortably into the high school game, despite the expectations on her to shine. She could have also moved on from the high school game, but did not want to miss out. For increased competition, Shoebottom also plays for the well-established Assabet Valley program in Concord, Massachusetts. There’s plenty of travel, but Shoebottom thrives on it. “It’s a lot of work but, to reach that dream, that’s what you have to do,” she said. Marshwood four-time champ set state all-time win record to cap his second Wrestler of Year season. Marshwood’s Cody Hughes had a wonderful senior season, going 52-1 with his fourth straight Class A state championship. In his last three years, he did not lose to a wrestler from Maine . The question was simple: Is Cody Hughes the best wrestler Matt Rix has coached in his 33 seasons at Marshwood High? This season Hughes was scored on infrequently in compiling a 52-1 record. He was not taken down until the New England Championships. Hughes claimed his fourth Class A championship when he won the 170-pound title, joining a select group that includes his longtime friend and teammate, Jackson Howarth. Hughes, who signed a national letter of intent to wrestle at Division I Virginia Tech, set a state record for career wins with 212 (against nine losses). He went a third straight year without losing to a wrestler from Maine, placed third at New Englands and helped Marshwood win a fourth consecutive Class A title. For those reasons, Hughes is the Maine Sunday Telegram’s Wrestler of the Year for the second straight season. Hughes’ connection to Marshwood wrestling is lifelong. He remembers going to Marshwood practices with his dad, Todd Hughes, then an assistant coach and the program’s first 100-win wrestler. “At first I just watched. Then when I was 4 or 5, I started rolling around a little bit,” Cody Hughes said. Hughes rolled into New Englands focused on winning after placing fifth, third and second in three previous trips. Connecticut champion Anthony Falbo beat Hughes 3-1 in the semifinal. Hughes will compete against other seniors at the NHSCA Nationals in Virginia Beach, Virginia, in the 160-pound division, on March 27-29. As a sophomore, Hughes won the 152-pound bracket. Hany Ramadan won two events at the Class A state meet. 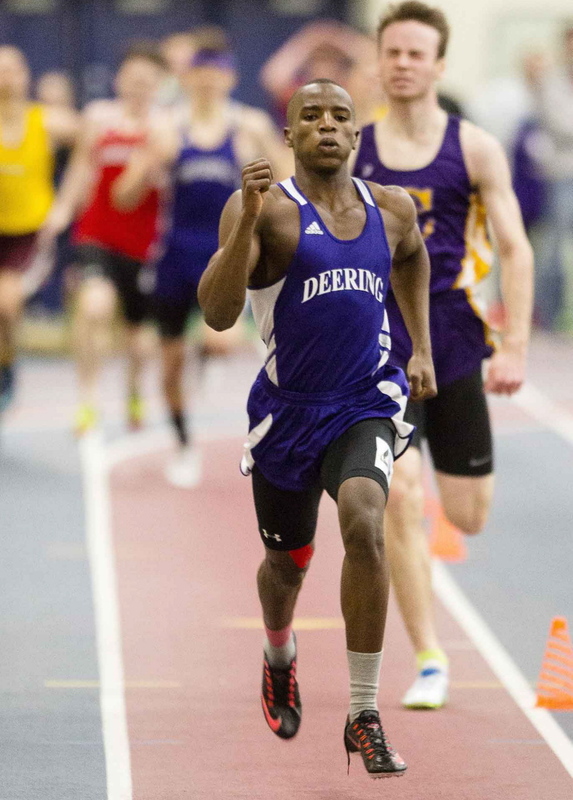 Hany Ramadan of Deering accomplished a huge personal goal last month, not only winning the 400 at the Class A state meet but setting a record of 49.78 seconds. He also won the state championship in the 200. Hany Ramadan has been through many challenges. As a young child he moved with his family from Sudan to Egypt to escape a violent nation. Seven years later they moved to Virginia as his family sought a more peaceful home. And just when life seemed simpler, Ramadan and his family moved to Maine at the start of his junior year of high school, putting the promising sprinter in one of the coldest states. Through it all, the only thing that has slowed the Deering High senior is injuries. After a hamstring injury sidelined Ramadan for the 2014 indoor season, he took second outdoors in the 400 (49.52 seconds), then was on the final stretch of the 200 when he heard his quadriceps pop. Ramadan, who had a personal-best time of 22.78 seconds, kept running to finish in 27.82 – 26th place. “I said to myself, ‘I’m not going to stop.’ Because I had wanted the state record in the 400 and the 200,” Ramadan said. After a summer off, the addition of a personal trainer and a full season of training, Ramadan is now one of New England’s top 200- and 400-meter runners. He won both events at the Class A indoor state meet in February, with a state-record time (49.78) in the 400. Then he took third in the 600 (1:22.34) at the New England championships. For his breakout season and dominance in Maine, Ramadan is the Maine Sunday Telegram boys’ indoor track athlete of the year. With an easy smile and natural exuberance, he tells stories about growing up in Egypt and how he came to run track. He describes how a track coach in Cairo spotted him playing soccer at age 12 and challenged him: Run a 400 and earn a spot on my team. Ramadan warmed up and without knowing how to pace himself, ran a 64-second quarter-mile. “That’s pretty good for someone who had never run one before. He has a kick. He has another gear,” Deering Coach Gerry Myatt said. Having achieved some of his goals, Ramadan’s next set has come sharply into focus. He wants one more state record, maybe two. And he wants to excel for an NCAA Division I school. Ramadan’s personal best in the 400 is 49.52. The Class A state record is 48.58, but Ramadan believes he can get there. Kate Hall of Lake Region continued to show that when she sets her mind to something, it gets done. 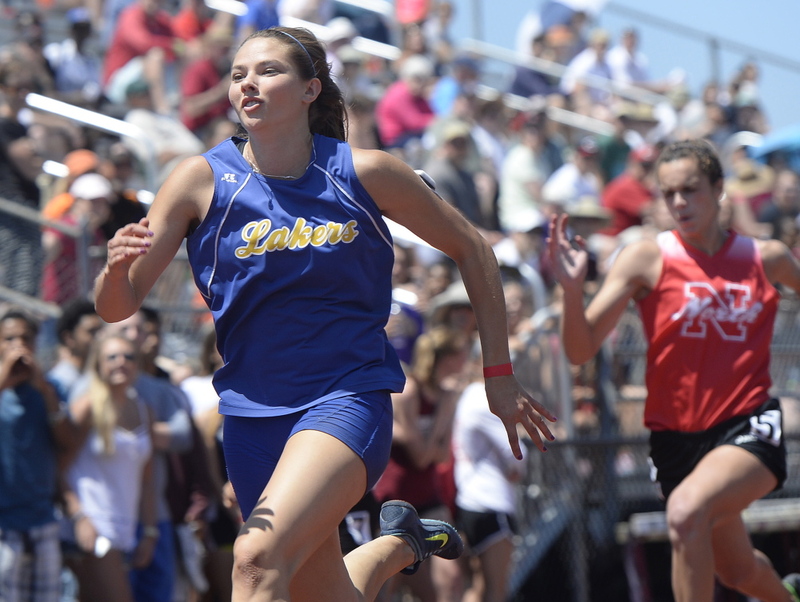 All eyes around the state were on Kate Hall of Lake Region this season as she reached new heights not only in Maine but as a national champion in the long jump. Last year at the New Balance Nationals indoor track and field championships, Kate Hall of Lake Region smirked and snapped a photo in front of a board listing meet records. Her goal was clear: to break the mark in the long jump as a senior. Classic Kate Hall. She checked that feat off her to-do list last weekend. Hall won the national title in the long jump with a leap of 20 feet, 11 1/4 inches, soaring 4 inches longer than the meet record and a full foot beyond her second-place finish at the nationals last year. By setting records this season at the New England championships in the 55-meter dash (6.95 seconds) and the long jump (20-6), Hall was the clear choice as the Maine Sunday Telegram’s indoor girls’ track and field athlete of the year – even before her performance at the national meet. But as Hall has done throughout her high school career, she continued to excel against the best in the country. In addition to becoming a national long jump champion, she took sixth in the 60-meter dash (7.47) to win All-American status in that event. The truth is, Hall rarely falls short of her goals. Many who have followed her career have come to believe no matter what’s at stake, Hall will deliver. “I am confident her consistent preparation, her mental toughness and her ability to rise up for the big meets has put her in a great position to earn this lofty title,” said Lake Region Coach Mark Snow before the nationals. With the help of personal trainer Chris Pribish, who has worked with Hall since she was in the eighth grade, Hall could tell she was stronger this season. 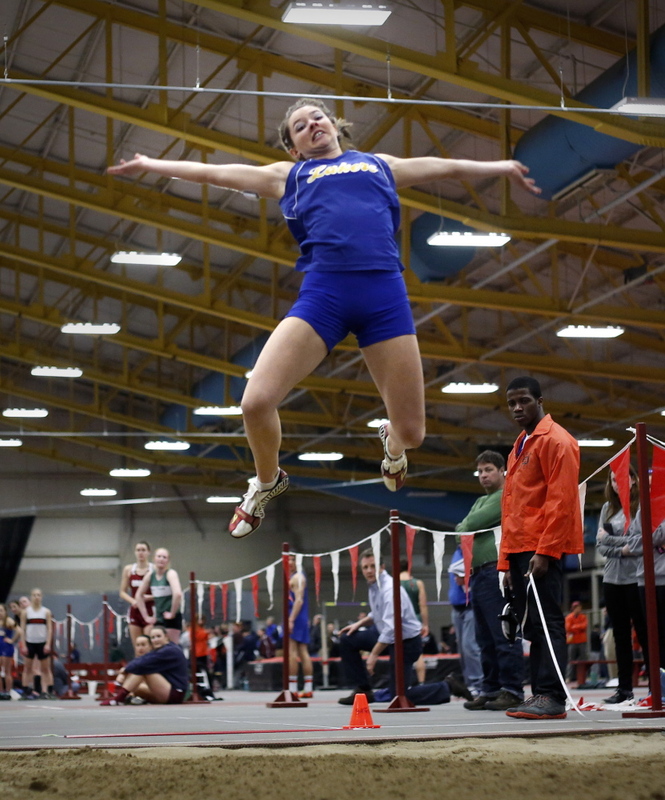 From her first 20-foot jump – 20-1 1/2 at a meet in Gorham on Jan. 16 – she gained confidence that the meet record at the nationals was within reach. “We could tell overall I was a lot stronger and more stable. My different jumps and plyometrics were looking quite a bit better. We knew it was going to be a good season,” Hall said. Hall, who will attend Iowa State on an athletic scholarship, swept all three of her events (55, 200 and long jump) at the Class B state championships, rewriting two state records. In addition, Hall went through the entire indoor season ranked first in the nation in the long jump. That was important to her. And yet she went into the national meet forgetting about any of her achievements – focusing instead on winning the title. “That is the biggest goal I’ve been thinking about all season,” said Hall. A broken foot last May didn't keep the Brunswick Junior away from the pool. Leading up to the Class A swimming and diving championship meet, Brunswick Coach David Bright was trying to figure out which two individual events versatile junior Nate Samson should enter. 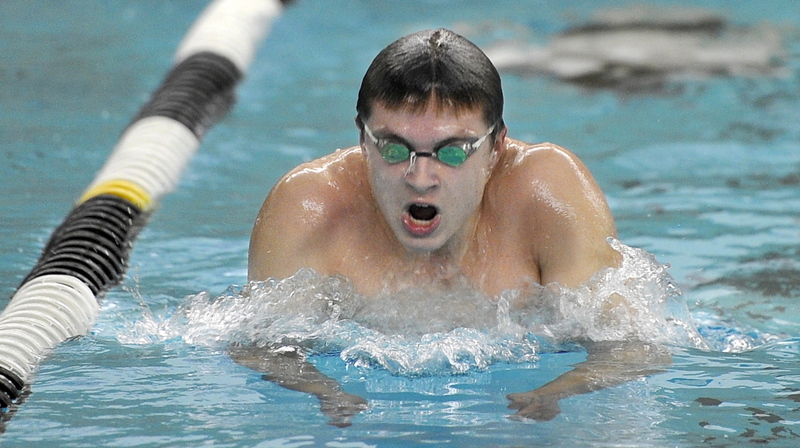 As a sophomore, Samson had won the 100-yard freestyle and 100 backstroke state titles. Back in December at the Morse Invitational, he won the 200 individual medley in a time – 1 minute, 57.01 seconds – that would hold up as the fastest in Maine this winter. Samson also had a blazing 50-yard free time of 21.51 from the KVAC meet, second only to Ellsworth junior Talor Hamilton. Competing against Falmouth senior Jake Perron and Cheverus junior Michael O’Donovan, Samson swam to a time five seconds better than that of the Class B champion and third-best in the state – but well behind Perron and O’Donovan. It was the only individual race of the season Samson didn’t win. Perhaps, had someone other than Samson been on the blocks for the anchor leg of the concluding 400 free relay. With one point separating Brunswick and Bangor in the race for overall runner-up behind champion Cheverus, Samson hit the water nearly half a second behind Bangor. But he surged and finished more than three and a half seconds ahead of the Bangor relay team, securing second-place hardware for the Dragons. The upcoming YMCA Nationals in Greensboro, North Carolina, will mark the end of Samson’s swim season, one that started amid uncertainty because he broke his right foot last May when he slipped on stairs while wearing wool socks. He was in a cast from knee to toes for eight weeks, but even that failed to completely keep him out of the water. After hours of physical therapy and hard work, Samson returned to the level he attained last year (10th in the nation with a 49.99 time in the 100 backstroke). He swam butterfly on the Brunswick medley relay team that set a state-best time in the season’s first dual meet, against Morse, and backstroke when the same quartet of Samson, Jacob Cost, Brian Hess and Henry Raker lowered it in early February to 1:38.18. Leila Johnston of Mt. Desert, the Performer of the Year in girls' swimming, will head to Florida State next season. Leila Johnson had a permanent place on the Class B state championship podium while swimming for Mt. Desert High. She won two invidiual events each of the past three years, and has been Performer of the Meet the past two seasons. As snow mounds continued to expand this winter, so many Mainers’ thoughts drifted to Florida. Leila Johnston, a Mt. Desert Island senior, was no exception. Johnston isn’t just planning a short visit. She’s committed to a swimming scholarship at Florida State. So, no more snow. Just a lot of swimming, something Johnston is used to. Her commitment to Florida State is simply another step in her dedication to the sport. “She has more (drive) than anyone I’ve ever coached,” MDI Coach Tony DeMuro said. That says something, considering the longtime success of DeMuro’s program. Johnston’s focus turned her ability into victory. She won two individual events at each of the last three Class B state championships – and was named Performer of the Meet at the last two. Last month she set two state records and almost a third, and also was part of two relay victories. Now one more honor: Johnston is the Maine Sunday Telegram’s girls’ swimming Performer of the Year. Johnston began swimming when she was 5 because that’s what her older siblings did. She tried softball in middle school (a line drive to the face ended that ambition) and track for one season, her freshman year. But she’s always concentrated on swimming and it’s paid off. 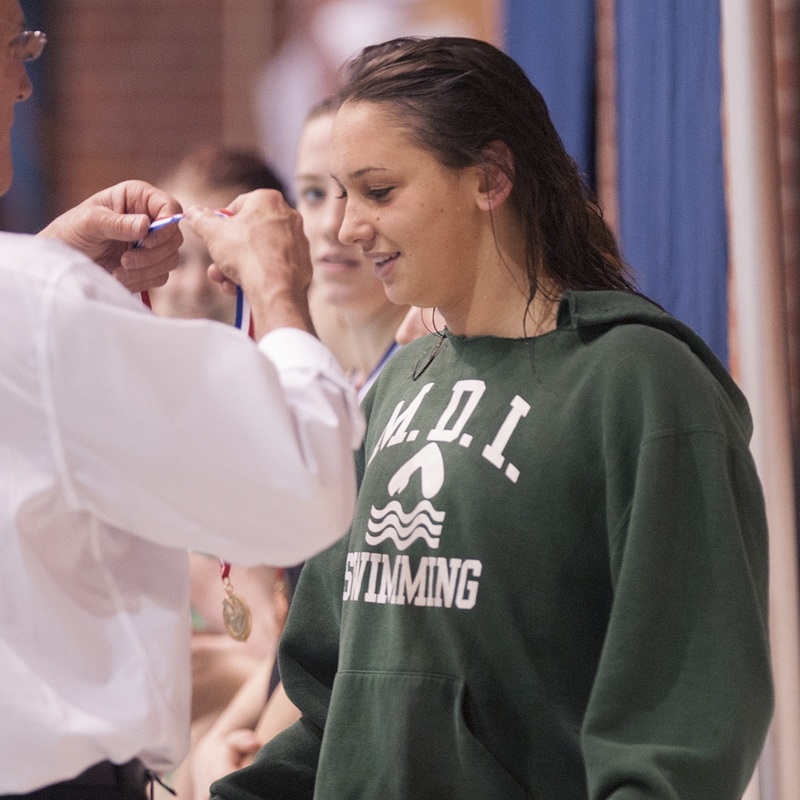 At the 2015 state championships, Johnston began the meet by taking part in MDI’s winning 200 medley relay, swimming a 24.86-second split for her 50-yard butterfly. In the next event, Johnston won the 200 freestyle in a state-record time of 1:50.63, winning by 12 seconds. In the 100 freestyle, Johnston won in another record time of 51.02. But she was not done. Johnston tried to break her own state record in the 50 freestyle by swimming the opening leg of the 200 free relay. She swam 23.59 – missing her 2014 mark by 0.03 seconds – but still led the Trojans to another relay victory. Before the season, Johnston wrapped up her college search. From several offers, she narrowed her choice to Florida State, James Madison, Duke, Arkansas and Virginia Tech. Her visit to Tallahassee made up her mind. “I really liked the team and the coach (Frank Bradley). They seemed interested in me as a person, not just my times,” she said. While most of the team is from Florida, the program has reached out to Maine before. Laura Flewelling of Scarborough recently swam for the Seminoles, and Colby Harvey of Cape Elizabeth (and Waynflete High) is a freshman on the team this year. Biddeford may not have a ski team next year, but Curtis Paradis created his own legacy. Curtis Paradis of Biddeford makes his way down the slalom course at Mt. 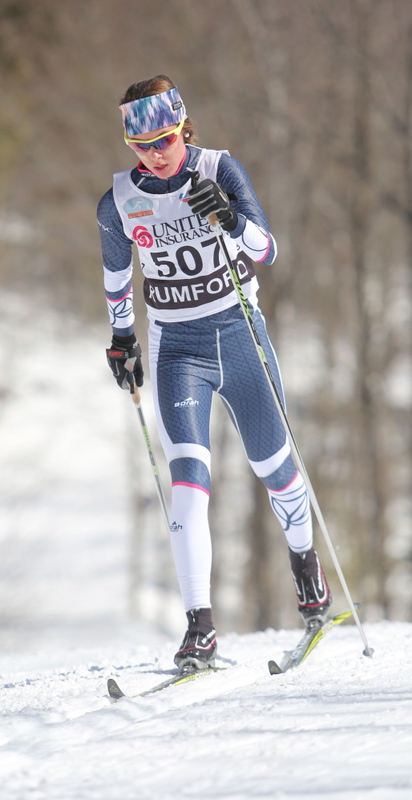 Abram during the Class A skiing state championships in February. 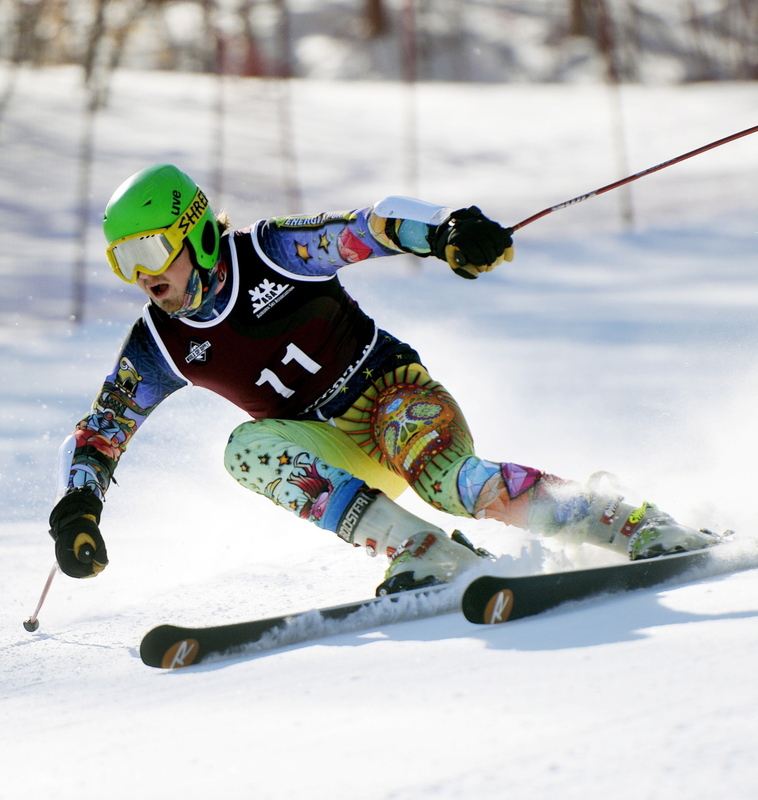 Paradis won the giant slalom this year to finish his high school career with three state titles. After eight years, an era is ending at Biddeford High School. No more will the Tigers field an Alpine ski team. Curtis Paradis will graduate this spring having carried on a family tradition started by grandfather Howard (a 2013 Maine Skiing Hall of Fame inductee following a 35-year coaching career in Madawaska) and continued by father Mike (the 1977 skimeister state champion when ski jumping was also in the mix) and sister Erin (a 2011 graduate of Biddeford High who won SMAA slalom and giant slalom titles). Erin paved the way as an independent skier. She was nominally aligned with Cheverus High (her Shawnee Peak coach also coached the Stags) and Curtis followed the same path for the succeeding four years. During that time he won three Class A state titles, including the giant slalom last month at Mt. Abram to go along with his 2012 and 2013 slalom victories. He also won every SMAA Alpine race he entered this season and was the first Maine finisher in both slalom and giant slalom at the recent Eastern High School Championships held at Gunstock Ski Area in New Hampshire. At the EHSC Paradis was 12th among 99 slalom skiers and 19th out of 103 in giant slalom. “I like taking risks and being on the edge and sending it to the post office,” said Paradis, the Maine Sunday Telegram’s choice as boys’ skier of the year. Sending it to the post office? Paradis, who also runs cross country and plays lacrosse, went over the edge last winter at Shawnee Peak with three gates remaining in his second Class A giant slalom run after posting the fastest time in the first run. He helicoptered, crashed and, after spitting up blood, wound up spending the night at Bridgton Hospital with a bruised lung. He returned this winter and, aside from breaking a pair of skis midway through the season after jumping from the starting gate, was back on track. Then came the state meet, and Paradis fell in his first slalom run and missed the third-to-last gate in his second. He won giant slalom by more than a second, posting the fastest time in both runs. Part of the reason for his successful comeback can be attributed to his visits to Madawaska with his grandfather. Woods a clear-cut choice for Maine’s top skier The Gray-New Gloucester junior defended her freestyle classical state titles, and more. Kaelyn Woods, a junior at Gray-New Gloucester, won Class B state titles in classical and freestyle for the second straight year. Placing 55th out of 84 Nordic freestyle skiers at the Junior National Championships in Truckee, California, earlier this month wasn’t exactly what Kaelyn Woods had in mind. Then again, she didn’t plan on passing out while climbing a steep hill late in the 4.9-kilometer course, which happens to be 7,200 feet above sea level. When someone suggested removing her skis and seeking medical assistance, Woods clambered up and finished the race, whereupon she collapsed again and this time was whisked to a hospital. She recovered quickly, and was the top Maine qualifier for the Eastern High School Nordic Championships at Black Mountain in Rumford this weekend, where she was sixth in the 5K freestyle race. A junior at Gray-New Gloucester High, Woods successfully defended her Class B state freestyle and classical titles as well as making her mark on the national stage. She is our choice at Maine Sunday Telegram girls’ skier of the year. In the season’s first meet, Woods placed second in a skate race to Freeport senior Elizabeth Martin. That was the only Maine high school race this winter Woods failed to win. She won nearly every race by more than a minute, including the chilly Class B classical race in Presque Isle. She followed that with a 31-second victory over Martin in freestyle. In addition to high school competition, Woods also raced NENSA’s Eastern Cup circuit with the Maine Winter Sports Center. This was her second year advancing to the Junior Nationals, where she rebounded from her freestyle bonk and placed 23rd of 85 girls in the 18-and-under 10K classical race. Juggling skiing with the rigorous academics of her International Baccalaureate program, Woods still found time to assist McEvoy with GNG’s middle school meets. She also excels at soccer and softball and won the state skimeister title as a freshman before opting to focus on Nordic. 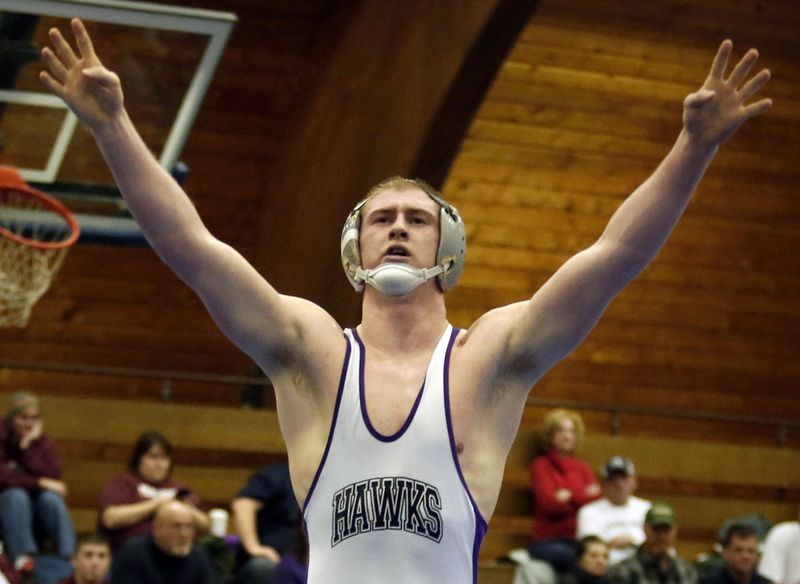 Already a wrestling champion, Brett Gerry led the Hawks to a football title. Brett Gerry had his playing time substantially reduced because Marshwood used reserves in the second half of blowouts. But still … a school-record 2,225 yards rushing and an eye-popping 12.3 yards per carry. Brett Gerry learned early that if you want to attain something, you have to work for it. Two individual state wrestling titles and now a Class B state football championship can attest to that fact. Gerry, a senior, has worked hard in the weight room and at practices, as have his teammates, and the rewards have come. This season, Marshwood football got a taste of the real Gerry. After a high ankle sprained limited his effectiveness as a junior, Gerry was healthy this fall and rushed for a school-record 2,225 yards. He scored 32 touchdowns as Marshwood (12-0) won the state championship Nov. 22 with a 44-18 victory against Brunswick. Because the Hawks had blowouts in 11 of their 12 games, Gerry carried the ball very little, if at all, in the second half of games but averaged an amazing 12.3 yards per carry. As a linebacker, he finished third on the team in tackles and had an interception. For his performance, Gerry was selected as Maine Sunday Telegram Player of the Year. “I have never had a player play or practice harder than Brett,” said Coach Alex Rotsko. “Brett Gerry might be the best all-around football player I’ve coached in 35 years. Rotsko said nobody works harder than Gerry in the offseason, describing him as an avid weight lifter and fitness fanatic. Gerry and a few of his teammates hit the weight room and got bigger and stronger. After going undefeated in eighth-grade football, Gerry and his teammates knew they had the potential to do something special in high school. Playing on the varsity as a freshman, Gerry was part of a team that went 2-6. Rotsko arrived from Longmeadow High in Massachusetts the next season and the Hawks won Western Class B, then fell to Mt. Blue 44-42 in a wild state final. Marshwood lost to Kennebunk last season in the regional final but was dominant this fall. “Ever since the eighth grade, we knew what our class was capable of,” said Gerry. Gerry carries a 91 grade-point average and wants to continue his football career in college. York's Lily Posternak, also a member of the U-17 national team, helped the Wildcats win the Class B title. Growing up, Lily Posternak loved playing soccer. Then she discovered field hockey. Good thing. Posternak may only be a sophomore at York High, but she plays with a maturity and skill level that belies her youth. She is a member of the U.S. under-17 national team and will compete in the Netherlands next spring. She is also the Maine Sunday Telegram field hockey Player of the Year for her efforts in helping the Wildcats win the Class B state championship this fall. Posternak scored 16 goals and 15 assists for York, but Coach Barb Marois, a former U.S. Olympian field hockey player, said those statistics didn’t tell the whole story. “She shows what hard work can develop into,” said Marois. “She has worked very hard at the sport and because of that she is the player she is, but she is very humble about it and is very encouraging of her teammates. She challenges them at practice and works to make everyone around her better. That was evident throughout the season when she would “air dribble” – balancing the ball on the hook of the stick at knee level while moving through the defense. It is not an easy skill to perfect, but it is nearly impossible to defend without fouling. Krista Chase, the coach at Mt. Ararat in Topsham, said Posternak has brought an excitement to the sport. “When I saw her reverse chip goal on the news one night, I thought to myself, ‘That just doesn’t happen all that often in Maine field hockey,’ ” said Chase. Posternak, who also plays basketball for the Wildcats, said she just took to the sport naturally. She hopes to play at the Division I level in college and continue on her national team path. She also feels fortunate to be learning the sport from Marois. Adam LaBrie scored his goals and reached his goals as Yarmouth overcame the disappointment of a year ago to win the state title. Adam LaBrie, right, playing in the state-final victory over Ellsworth, more than doubled his goal total of a year ago. He will play at Thomas College. As a junior, Adam LaBrie of Yarmouth was a good forward on a team that fell short of its goal. This season, LaBrie was the Clippers’ best player. He more than doubled his goal production, and Yarmouth won its first Class B boys’ soccer championship since 2010. “Adam was the No. 1 reason why we won the title, but he never acted like it,” Coach Mike Hagerty said. Based on his improvement and his team’s accomplishment, and emphasized by his three-goal game against Greely in the Western Maine final, LaBrie is the Maine Sunday Telegram Player of the Year. The other player most highly considered for the honor was Deering’s standout midfielder, Stephen Ochan. LaBrie, Ochan and Hampden Academy striker Tristan Granger were Maine’s three choices for the National Soccer Coaches Association of America all-region team. LaBrie also had a hat trick in the regular-season finale at Falmouth. Hagerty said LaBrie is the first Yarmouth player in his 18 years coaching at the school to score three goals in a game against Falmouth or Greely. As a junior, LaBrie had a solid season, scoring 11 goals, but Yarmouth suffered its first loss of the season in the regional final against Greely. “From Day 1 of preseason this year we kind of had a chip on our shoulder and the seniors, especially, had that feeling we could get it done,” LaBrie said. LaBrie was quick to credit teammates and coaches for his scoring spike. He noted that he worked well in a two-striker format, first with Henry Coolidge, and during the stretch run with junior Patrick Grant. Assistant coach Eoin Lynch, a former standout at Yarmouth and Providence College, focused LaBrie’s training on one-on-one situations with the goalie. “My teammates, they moved the ball around and all I had to do was finish it,” LaBrie said. Hagerty said LaBrie also became a stronger player this season, which allowed him to fight through contact more consistently, thus creating more chances. LaBrie plans to continue his soccer career at Thomas College. “All I really wanted to do was to go to college, play soccer, have fun and be on a team,” said LaBrie, who is also a four-year varsity basketball player at Yarmouth. 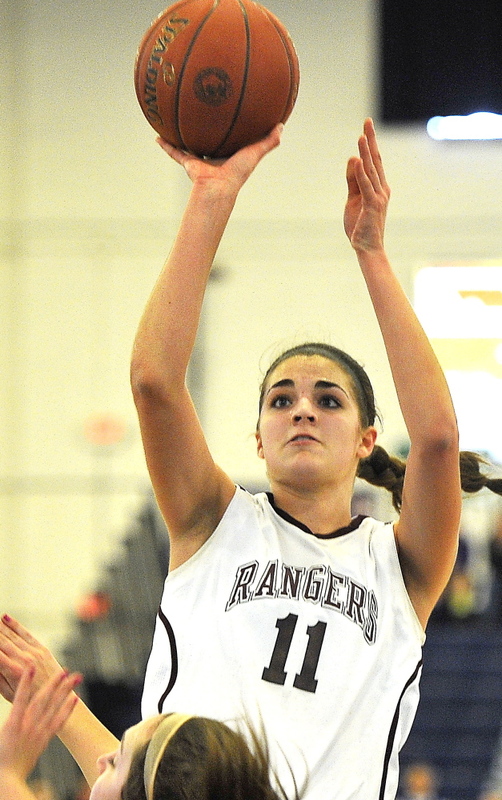 Windham's Cassie Symonds, always at the center of the action, led her team to another title. Cassie Symonds’ ability to control games from her midfield position was a key to Windham going undefeated for the second straight season on the way to consecutive Class A state championships. On a team of stars, Cassie Symonds was the brightest for Windham High’s Class A championship girls’ soccer team. The action orbited around Symonds, a Holy Cross-bound center midfielder. Her ability to dominate both on the ground and in the air – despite being a tick under 5-foot-4 – provided Windham (17-0-1) with a near-constant flow of attack. Symonds edges her prolific goal-scoring teammate, Jenna Soucy, and Thornton Academy’s dangerous striker, Tori Daigle, as Maine Sunday Telegram Player of the Year. Symonds was also the 2013 Player of the Year. After outscoring foes 98-5 in a 13-0-1 regular season, Windham had to come from behind in the second half in each of its four playoff wins. Coach Deb Lebel said the Eagles’ bid for a second straight state title could easily have ended in a regional quarterfinal loss to Portland. “Without Cassie, I tell you, those outcomes might have been a lot different,” Lebel said. In the regional semifinals, it was again Symonds’ ability to dominate the midfield that fueled a 3-2 overtime victory over Thornton Academy. Over and over she won contested balls, expertly reading goal kicks, stepping in front of attempted clearing passes and making solid one-on-one tackles. Windham beat Scarborough 2-1 in the regional final and blitzed Edward Little 5-1 with five second-half goals in the state final. Symonds said she hopes to play midfield in college and will continue to train through the winter and spring. 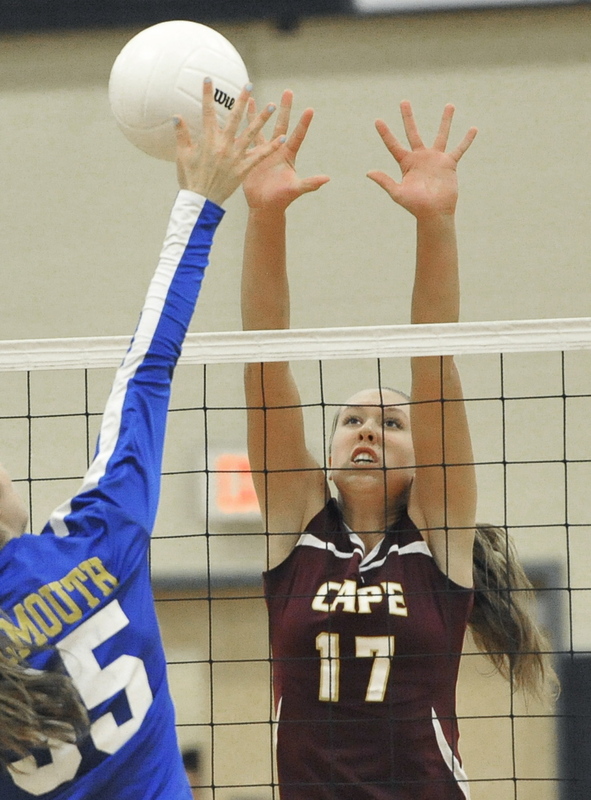 Tess Haller helped Cape Elizabeth reach new heights this season. Her dominant play from a new position was instrumental to the Capers’ first volleyball state title. Aaron Willingham joins a long tradition of strong runners from Mt. Blue. Aaron Willingham learned the hard way as a junior that quantity isn’t necessarily better than quality when it comes to training for cross country. He cut back on his mileage this fall, stayed healthy, and won the Class A state championship, along with KVAC and Eastern Maine titles. Aaron Willingham started running in seventh grade to get in shape for football in his native Texas. “I was a little pudgy,” he said. Now a senior at Mt. Blue High in Farmington, Willingham has long since traded in cleats for spikes. He followed up his Eastern Class A cross country title by winning the Class A state championship, running a best-of-the-day time of 16 minutes flat over 5 kilometers at Troy Howard Middle School in Belfast. 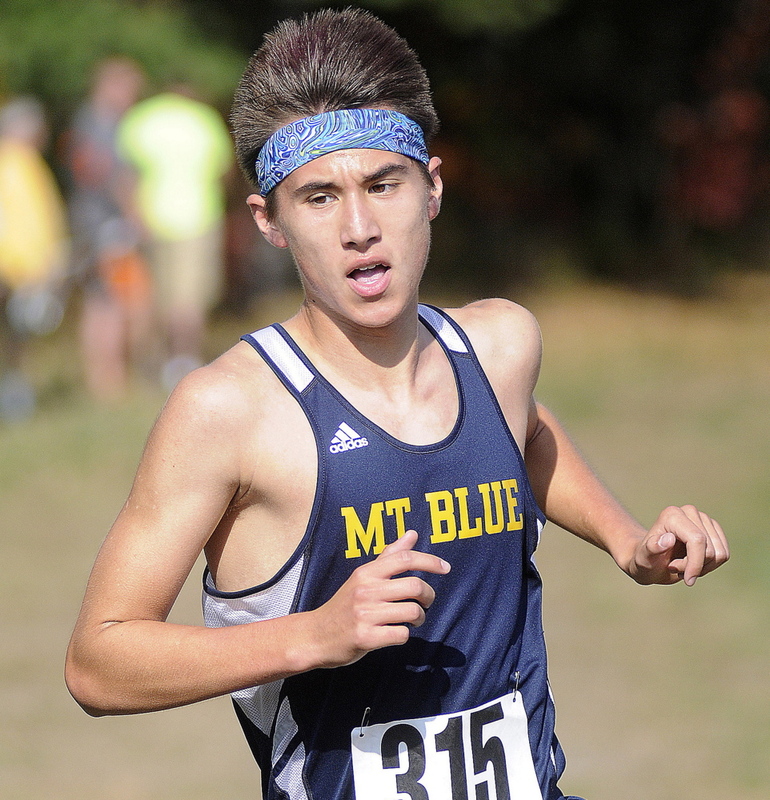 He is our Maine Sunday Telegram Runner of the Year for boys’ cross country. After moving to Maine the summer before his junior year, Willingham made an immediate impression by finishing second in the Festival of Champions with a time (15:42) that broke the school record set by Cullenberg’s son, Kelton. Willingham muddled through the rest of the season and started – but couldn’t finish – the state meet. This fall he cut back on mileage – focusing more on speed than endurance – and avoided injury. He won the Kennebec Valley Athletic Conference meet and set a course record at Cony High. His biggest problem, as it turned out, was staying upright. He fell twice on the Belfast course, in the Festival of Champions and the Eastern regional, both times near the 1-mile mark. He wound up winning the latter and placing sixth in the former. At the state meet, on the same course in even more treacherous conditions, he managed to keep his footing and won a kick to the finish line against Falmouth senior Bryce Murdick and Deering senior Iid Sheikh-Yusuf. All three finished within about a second of each other. At the New England meet, Murdick edged Willingham by a second to become the first Maine finisher. They were 19th and 22nd, respectively. Willingham is president of Mt. Blue’s chapter of the National Honor Society. He’s also a member of an improvisational comedy troupe called the Curtain Raisers. He plans to continue running competitively in college, and is considering the University of Maine and the University of New Hampshire. His potential major? Physical therapy. Katherine Leggat-Barr switched from soccer to cross country at Greely, and the result was a stellar season for the sophomore. 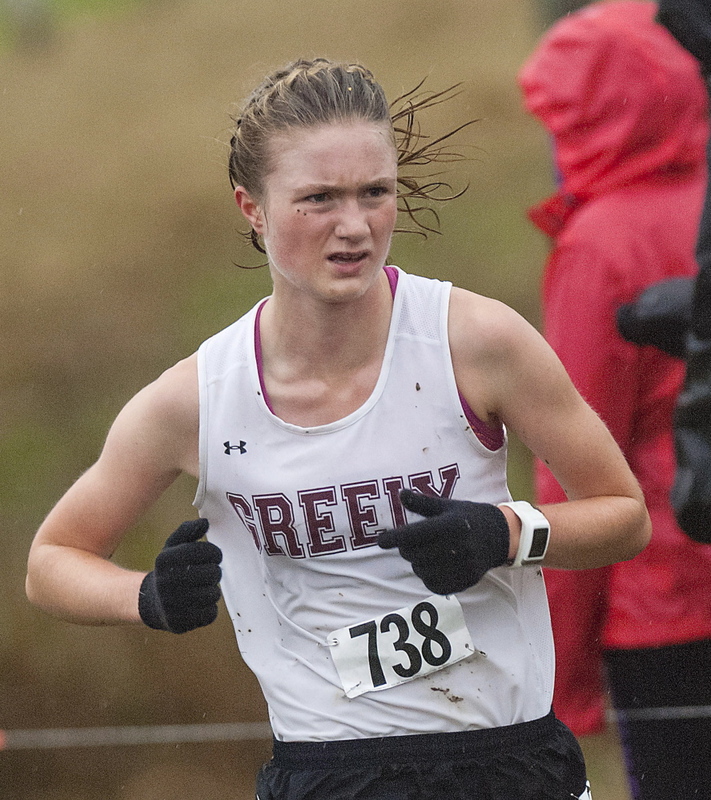 Not only did Katherine Leggat-Barr win the Class B individual state championship in her first high school cross country season, but she also led Greely to the team championship. Greely High cross country coach David Dowling first heard about Katherine Leggat-Barr last spring, when one of his runners told him about a freshman soccer player who had broken 20 minutes in a local 5-kilometer road race. Further investigation revealed that Leggat-Barr not only played soccer, but basketball and lacrosse as well. What’s more, she would often run for fun after team practices. Leggat-Barr opted for cross country this fall instead of soccer, and the result was both individual and team state titles in Class B and a best-from-Maine performance at the New England meet in Connecticut. Leggat-Barr is our Maine Sunday Telegram Runner of the Year for girls’ cross country. In the Western Maine meet, she was the only girl to break 20 minutes – finishing in 19:46 over the demanding Twin Brook course to win by more than half a minute. At the state meet in Belfast, in the last of six races over a course muddied from cold rain and continued use, Leggat-Barr led a 1-2 finish with freshman teammate Izzy Evans. They were 16 seconds apart, with Leggat-Barr winning in 19:17. And that was after Leggat-Barr slipped at the start of the race and then worked her way to the front of the pack. More important than time, however, was Greely turning the tables on Western Maine champion Yarmouth. The Rangers turned a six-point regional deficit into a five-point state title victory with help from senior Emily Mason, junior Sophia Stickney and freshman Kate Curran. At the New England meet, Leggat-Barr placed 32nd in a time that was 13 seconds and eight places ahead of Maine’s next runner, Class C state champ Hannah Steelman of Orono. “I had done fairly well in middle school, so I knew I was going to be able to compete pretty well,” Leggat-Barr said. “But I had no (idea) that I was going to win the states. 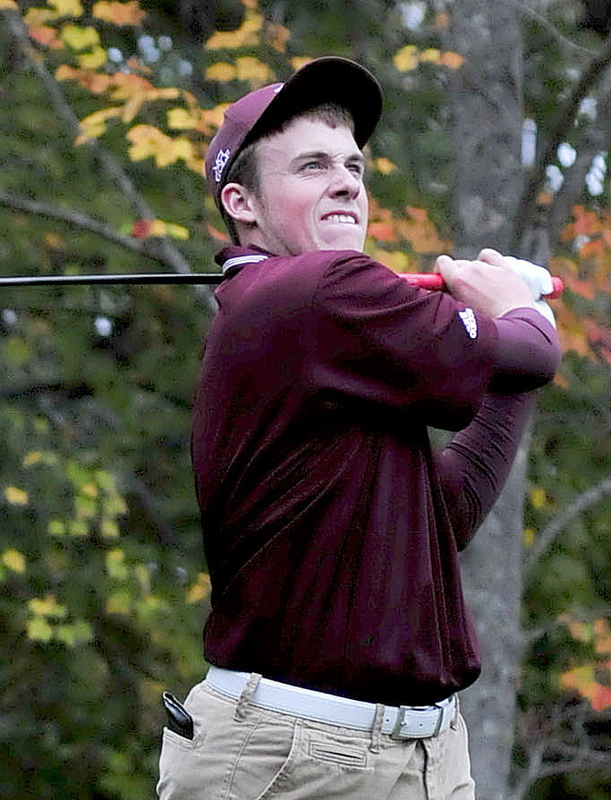 Gavin Douglas, a senior at Maine Central Institute, got an early start in the game because his father is a golf professional and his family owns a golf course – J.W. Parks in Pittsfield. Hashilla Rivai, a junior at Thornton Academy, is a native of Jakarta, Indonesia. “Hashilla plays one shot at a time and doesn’t dwell on bad shots. She focuses on the next shot,” said Coach Jeff Camire. The biggest adjustment for golfer Hashilla Rivai of Thornton Academy, a student from Jakarta, Indonesia, was getting accustomed to Maine’s chilly falls. Her golf game didn’t waver. She was on par and sometimes under it. Rivai, in her first year at the Saco school, opened eyes with her sterling play this season. She won the state schoolgirl championship with a 2-under 70 on Natanis GC’s Arrowhead course. She had four birdies and two bogeys. Soon after her arrival, she become Thornton’s No. 1 player. Rivai had a 35.2 stroke average and an overall record of 10-0 in team matches. She won 191/2 out of a possible 20 points in matches. She shot a 69 in a practice round before the state tournament. Rivai is the Maine Sunday Telegram’s Player of the Year for girls’ golf. “Hashilla has a great approach to her game,” said Thornton Coach Jeff Camire. In the team championship the week before the individual championship, Rivai shot a 74 to pace the Golden Trojans to a third-place finish in Class A. With the entire team returning for next year, Thornton will be in good position to win it all in 2015. Rivai said she plans on returning for her senior year, chilly weather and all. “It was really a good experience this season,” she said. 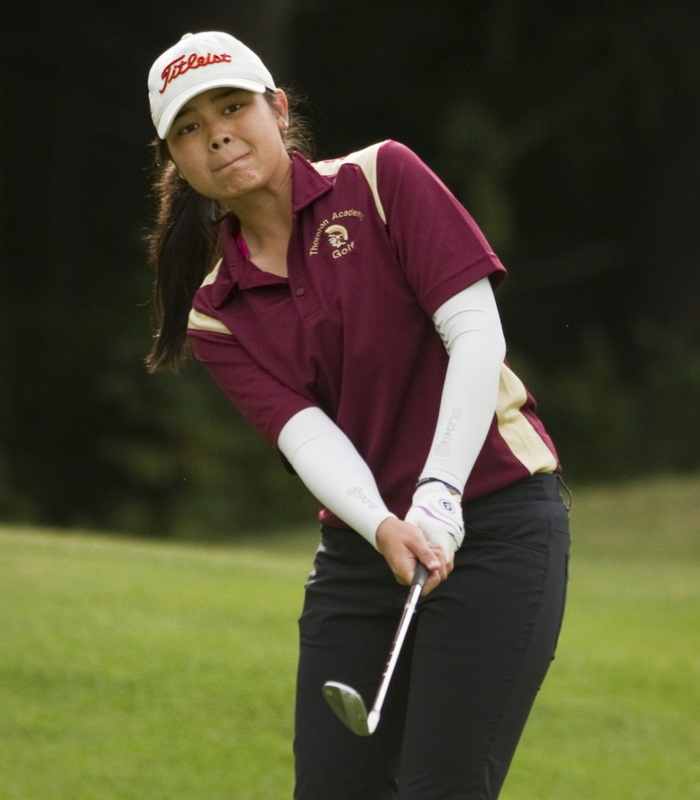 Even after the state tournaments, Rivai said she continued to play at Biddeford-Saco Country Club, Thornton’s home course. The last time she played was two weeks ago. “I guess if I want to play this winter it will be indoor golf,” she said. Rivai said she will visit cousins in Los Angeles over the Christmas vacation break, but wasn’t sure if she would bring her golf clubs. Her cousins don’t play golf.